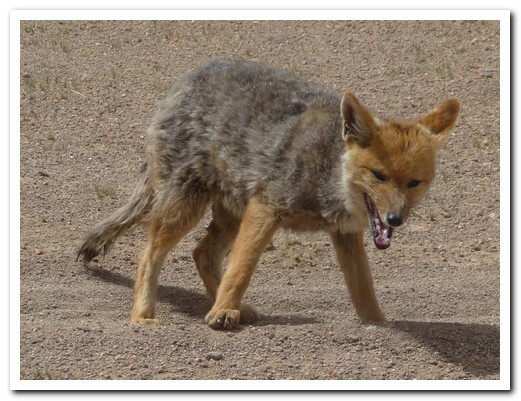 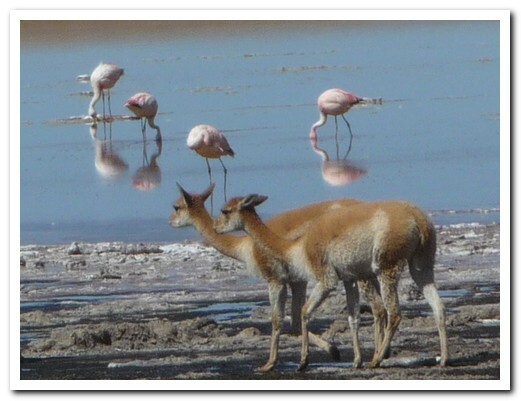 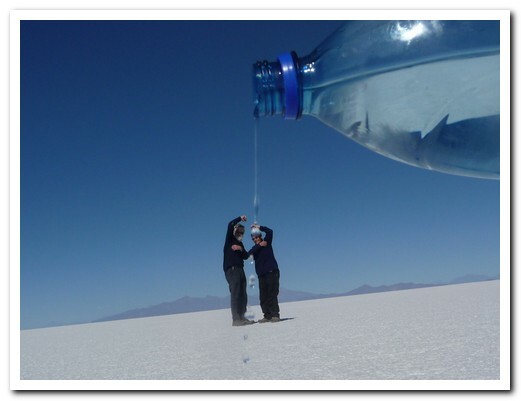 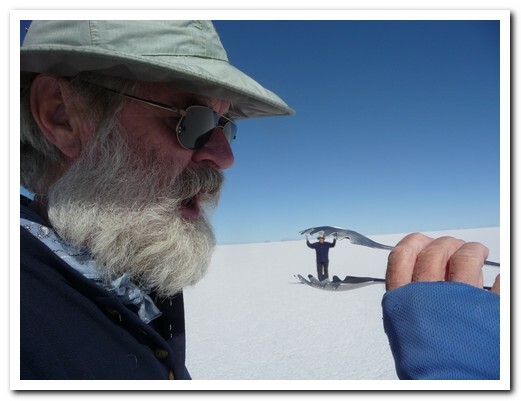 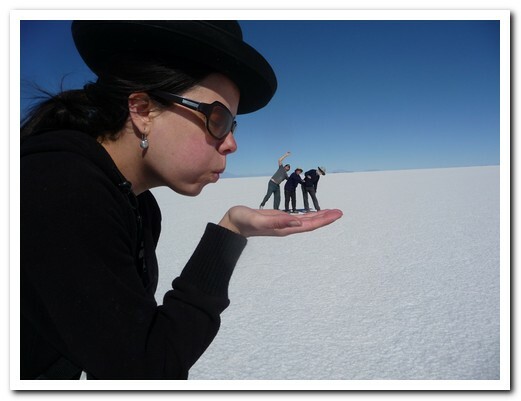 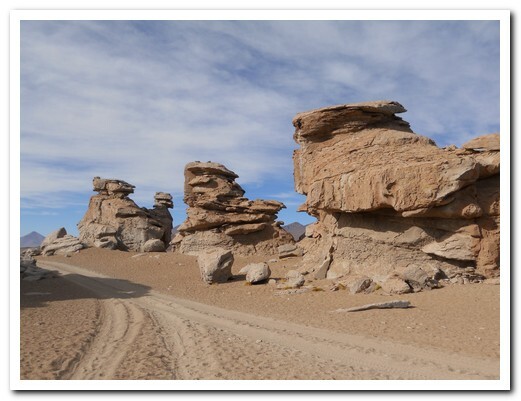 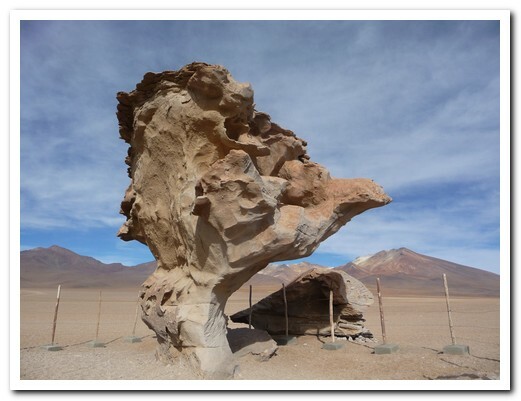 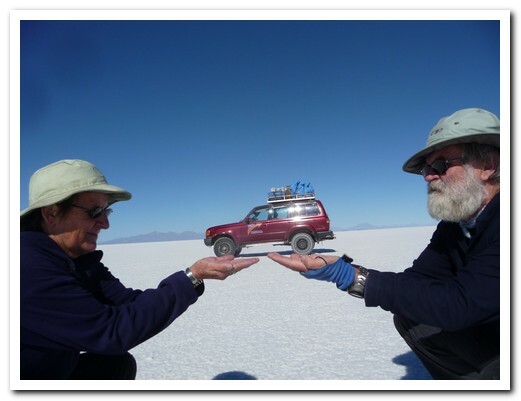 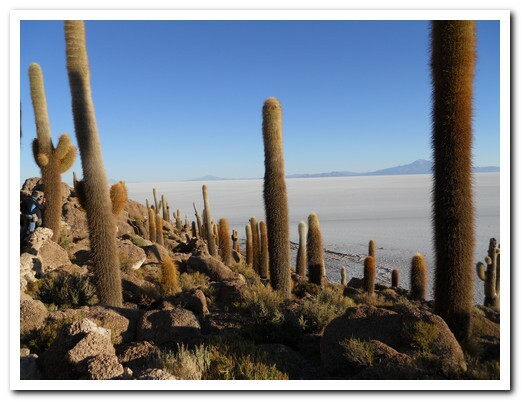 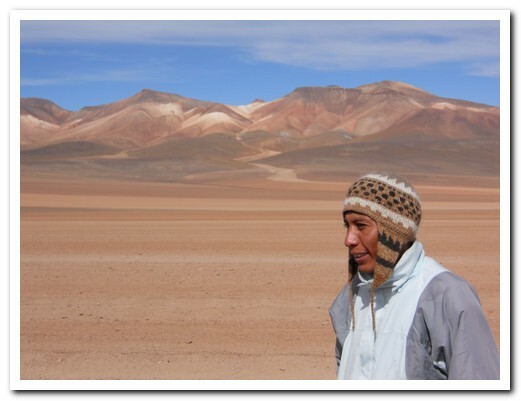 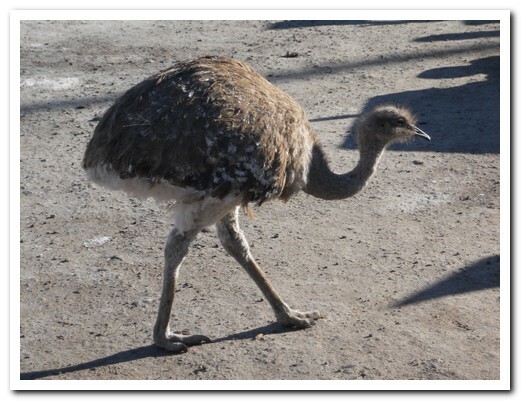 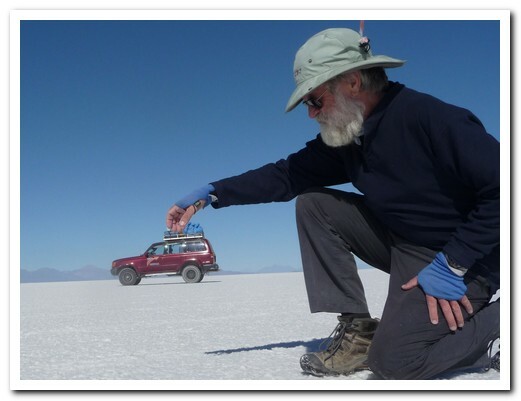 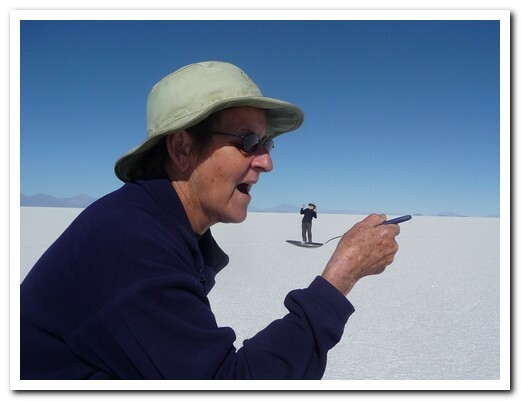 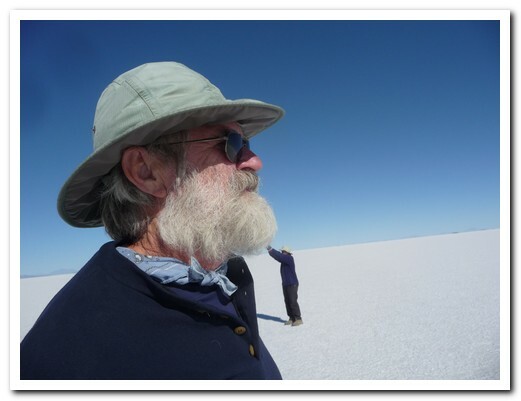 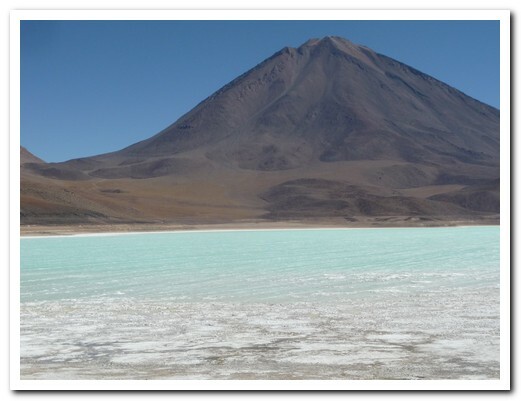 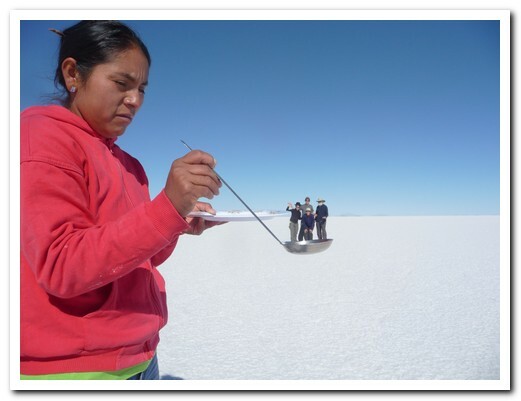 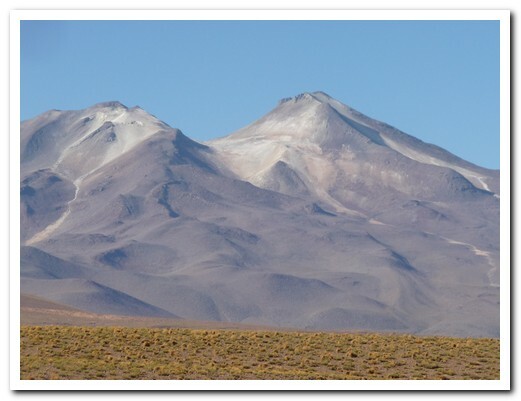 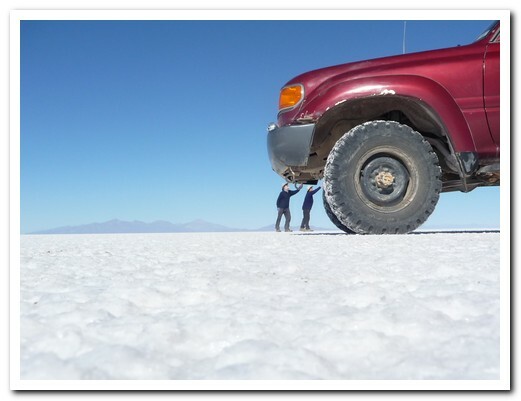 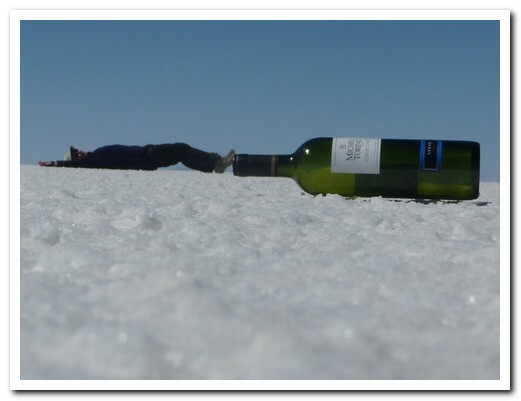 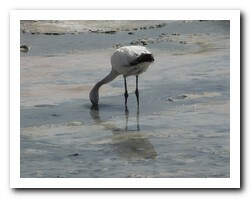 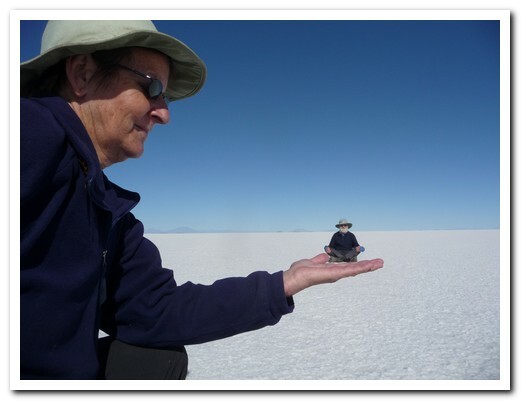 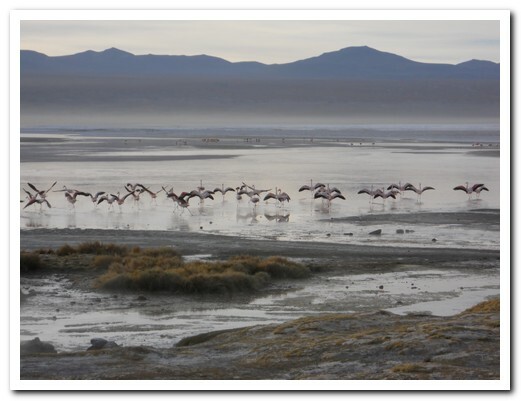 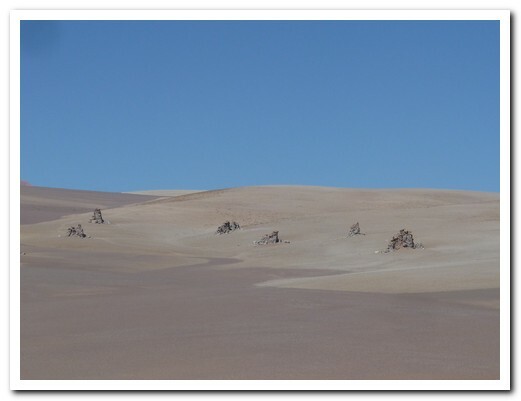 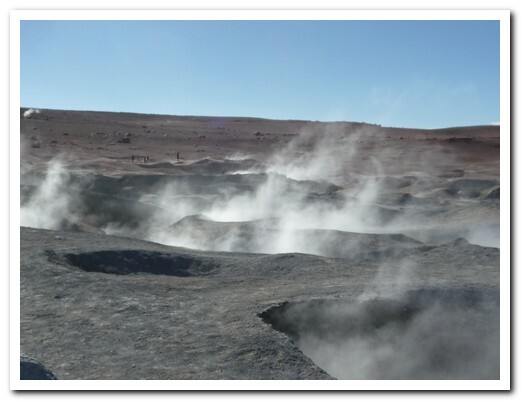 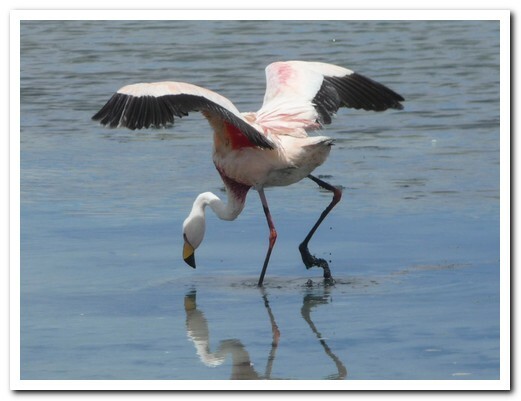 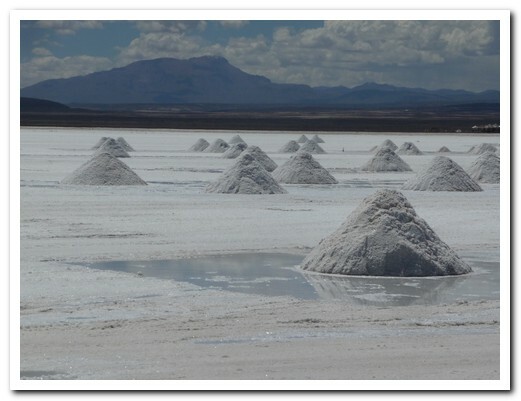 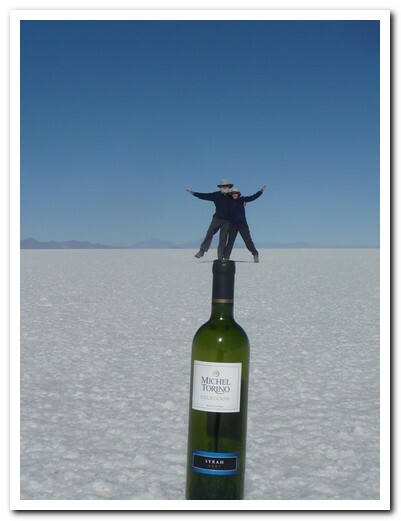 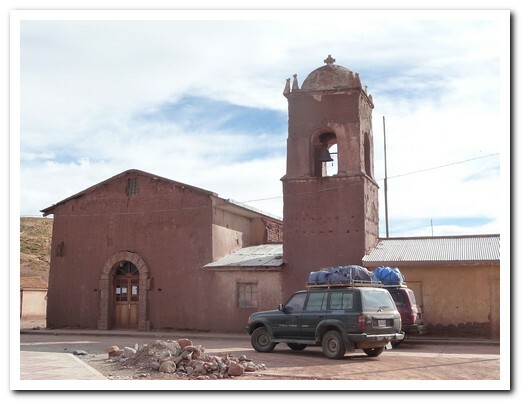 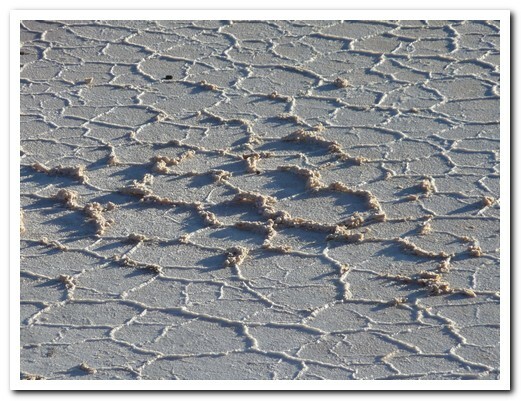 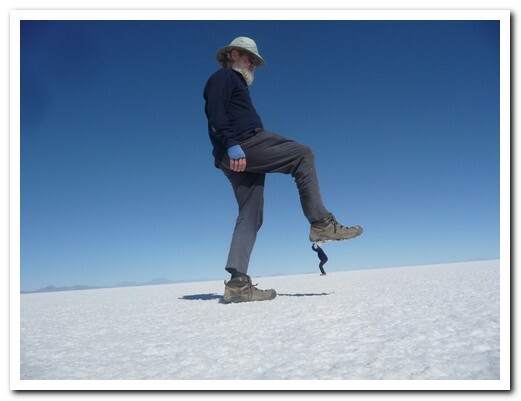 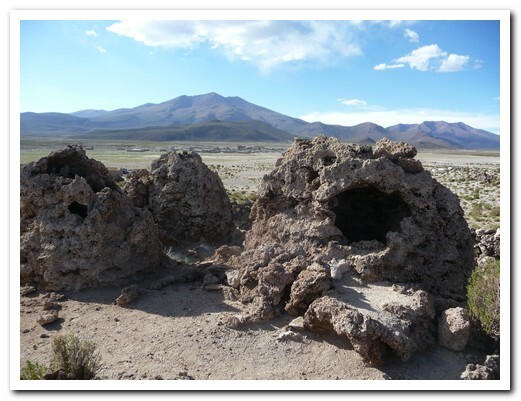 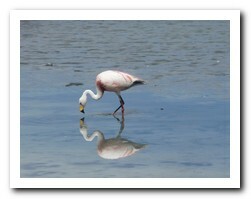 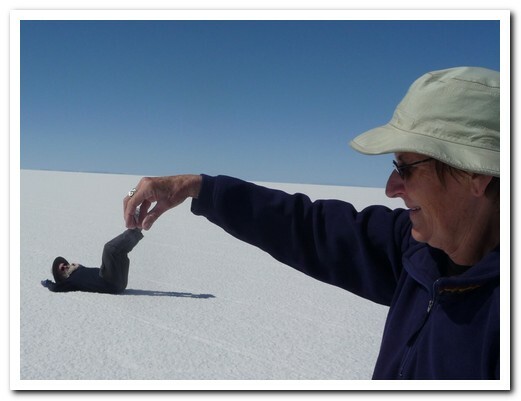 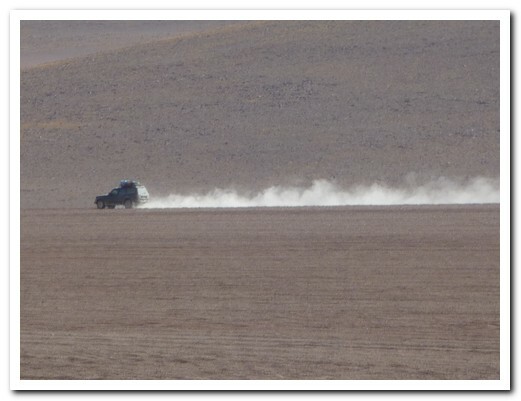 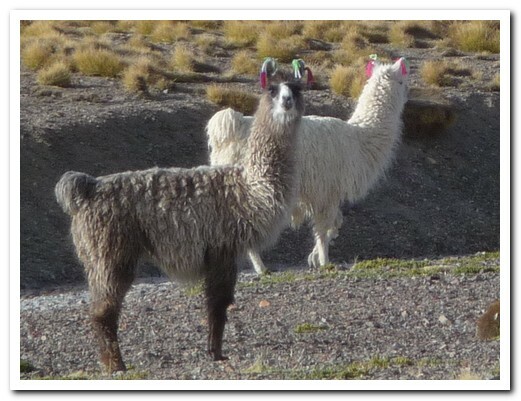 A fine introduction to Bolivia was a 4 day excursion with Tupiza Tours from Tupiza to Uyuni via the Uyuni Salt Flats. 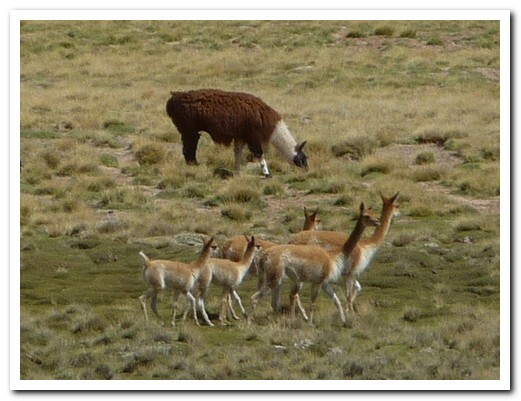 Through the Quebrada de Palala our 4 x 4 ascended to the high plains where llama and the smaller, endangered vicuña graze. 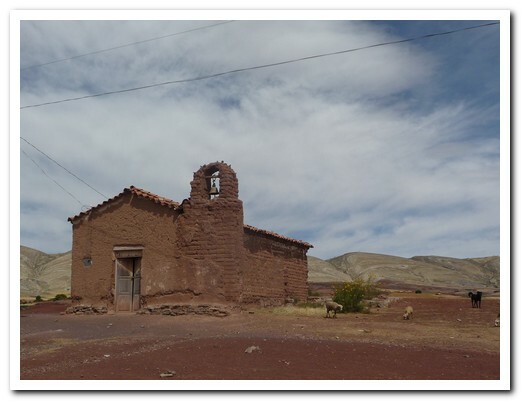 After the abandoned (ghost) mining town of San Antonio we visited hot springs, coloured lagoons with flamingos, geysers, multi coloured volcanoes both dormant and active, a necropolis in tiny San Juan containing remains of pre Inca people, strange lava formations as well as a ¨Dali¨ desert – all between 4000 and 5000 metres. 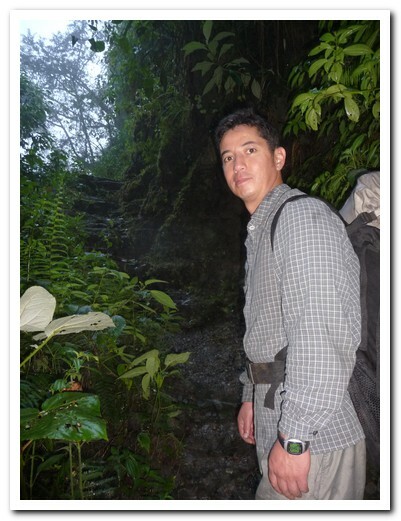 We were in good hands with our driver/guide Victor, who was very informative and always cheerful. 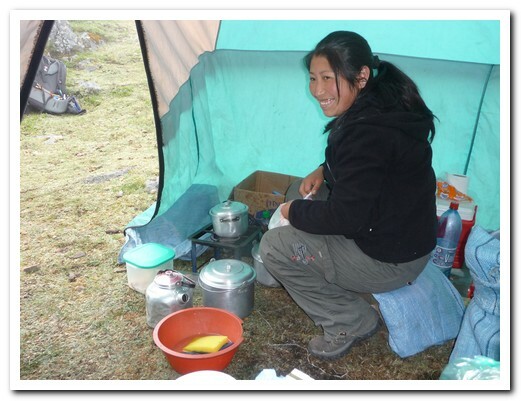 Magali, our cook kept us well fed, getting up in the early hours to prepare wonderful meals. 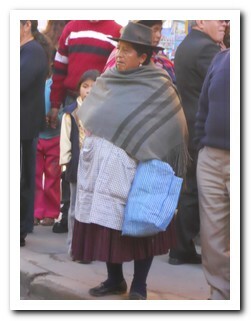 Her dried llama tamales were delicious. 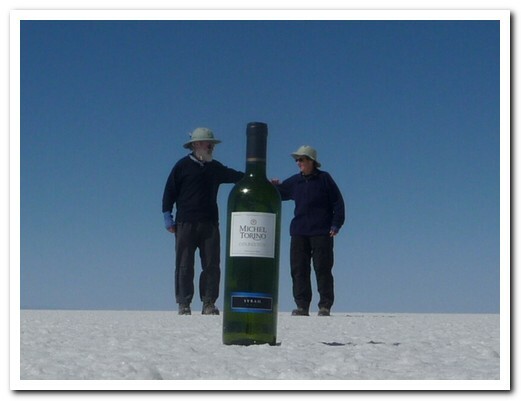 Together with Mariana and Martin from Argentina we had a great experience. 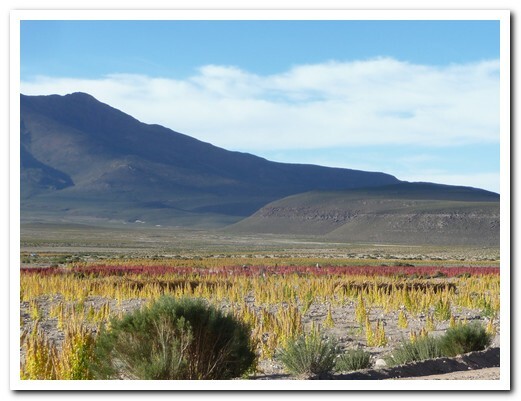 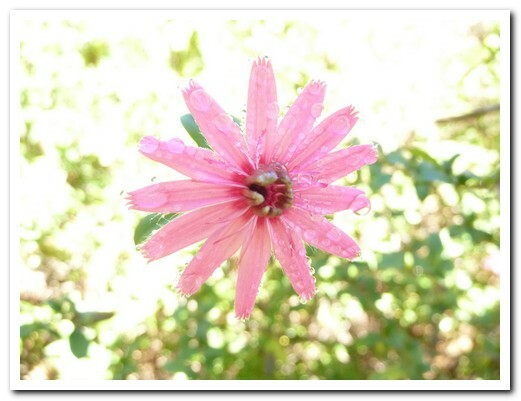 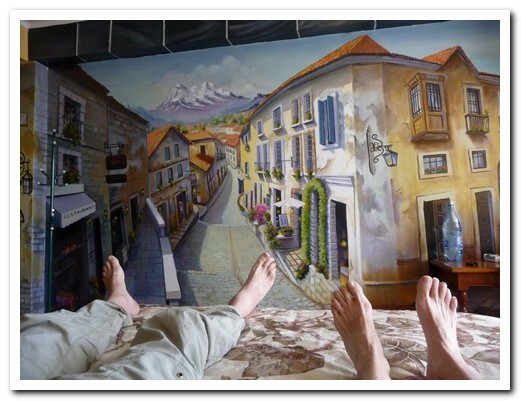 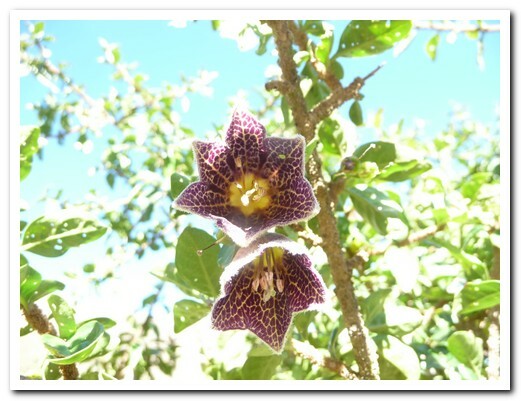 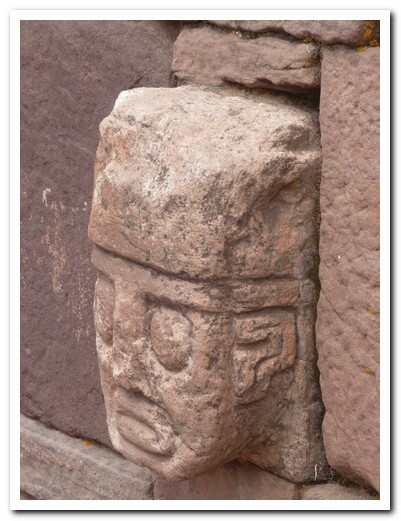 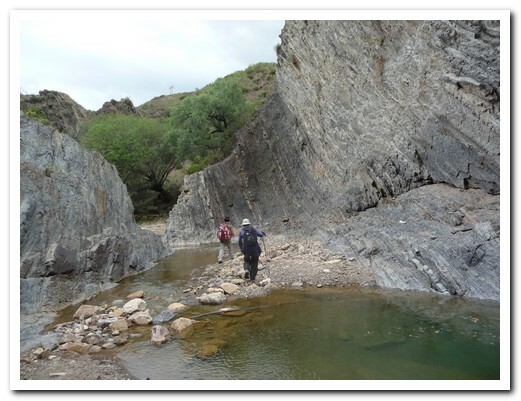 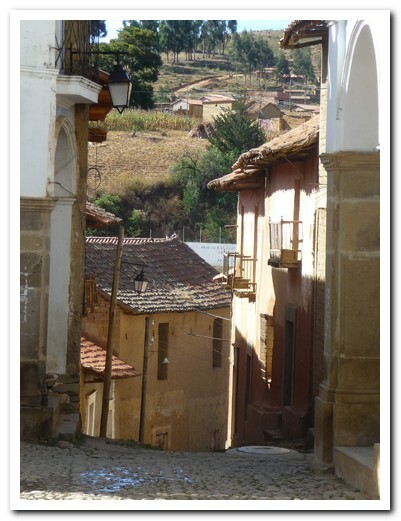 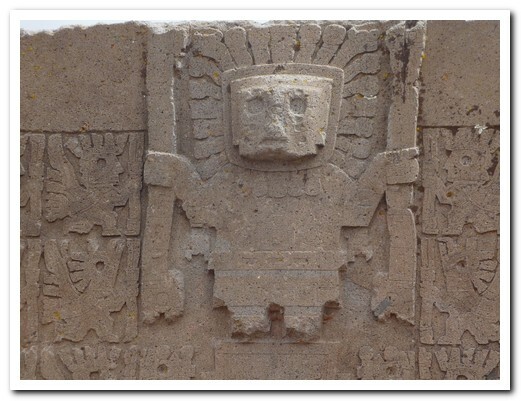 … continuing on our excursion with Tupiza Tours. 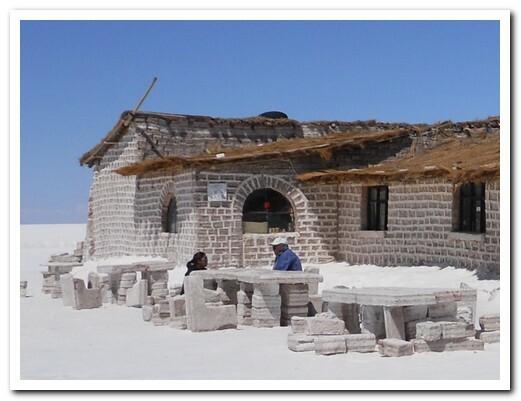 On the edge of the salt flats, we spent a night in a hotel made entirely of salt – salt brick walls, salt floor as well as salt beds, tables and chairs. 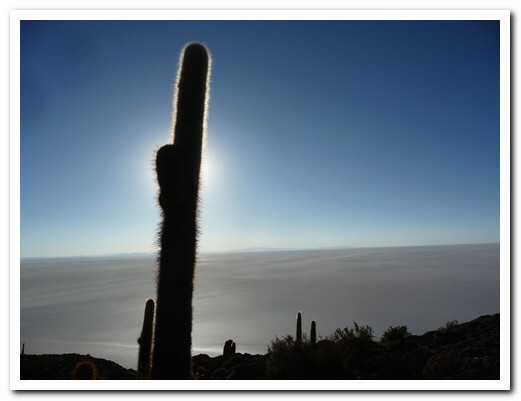 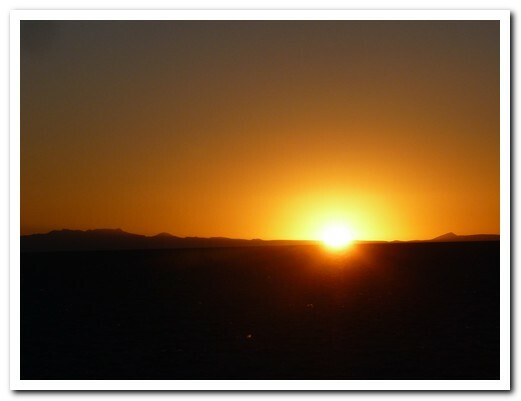 Our final day began as the sun rose over the largest salt flats in the world, El Salar de Uyuni (10.5 square kilometres) at 3700 metres. 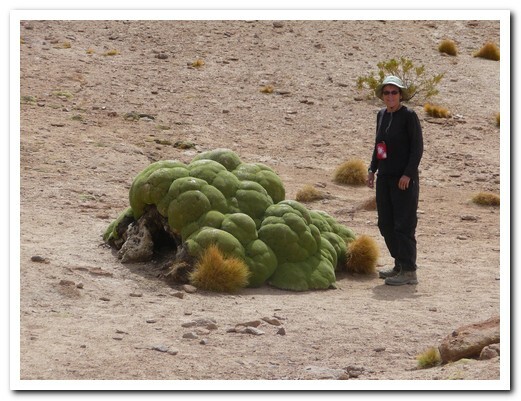 In the middle is La Isla del Pescado (Fish Island), a coral island covered in Cardon cactus. 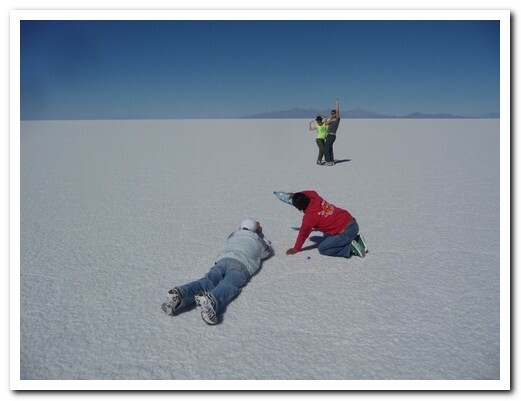 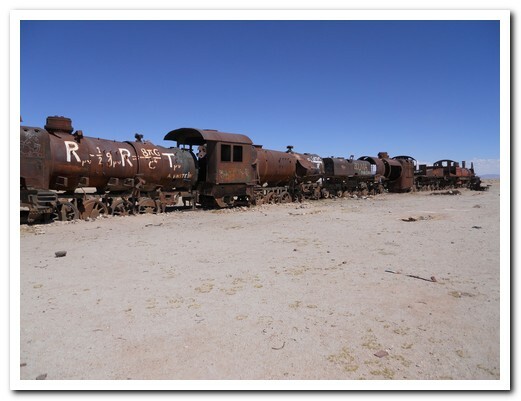 We spent some time composing tricky camera shots on the salt surface before ending our excursion at Uyuni with its train cemetry where all Bolivian trains go when they die. 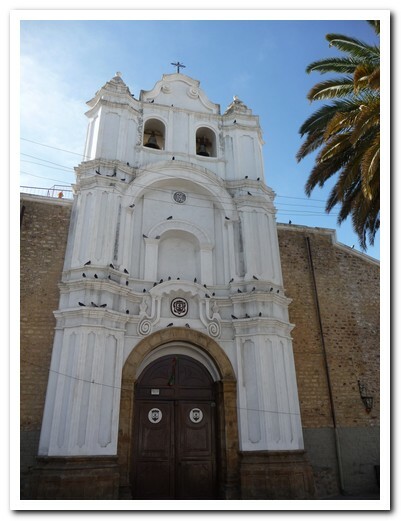 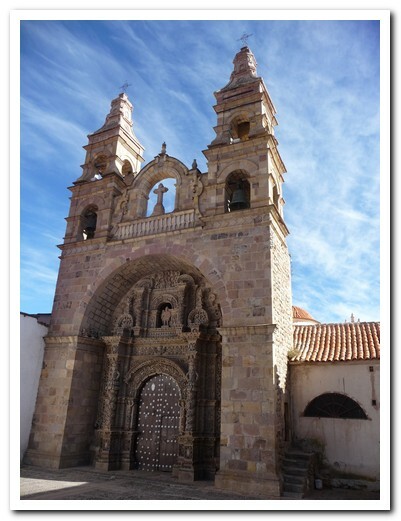 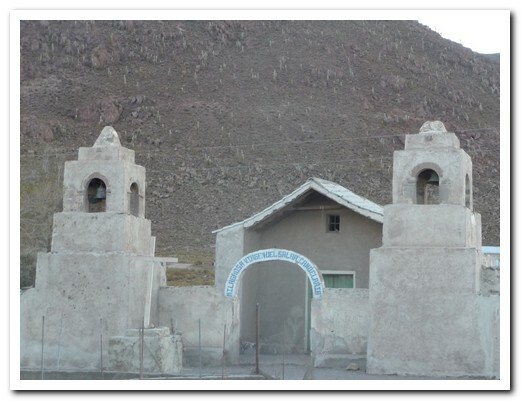 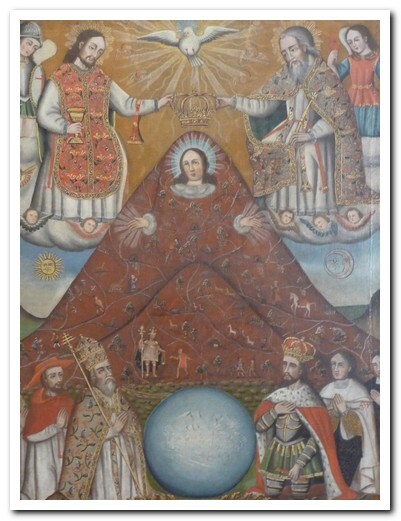 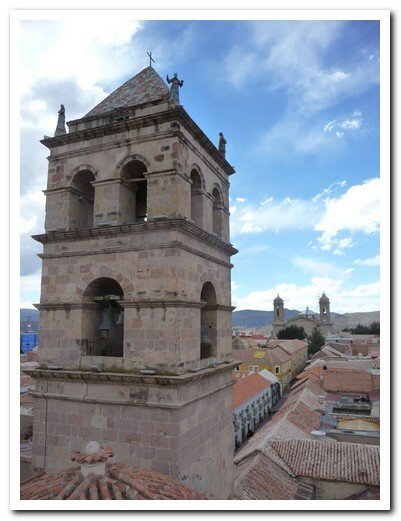 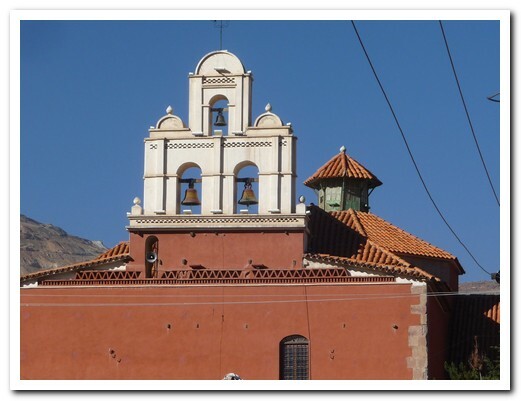 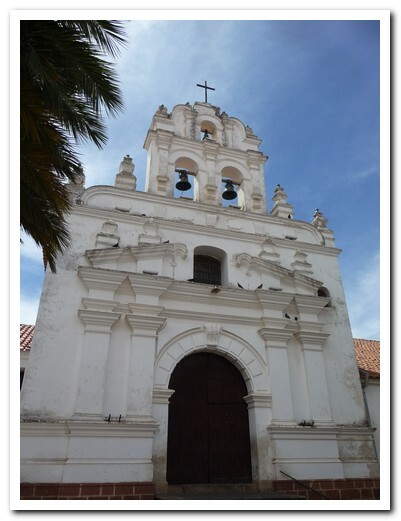 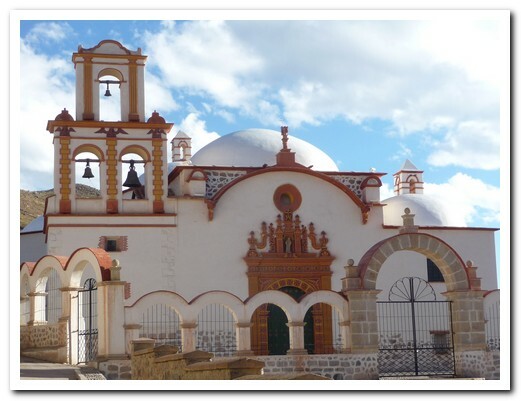 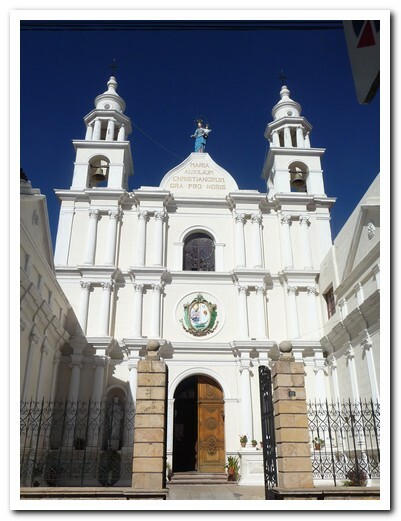 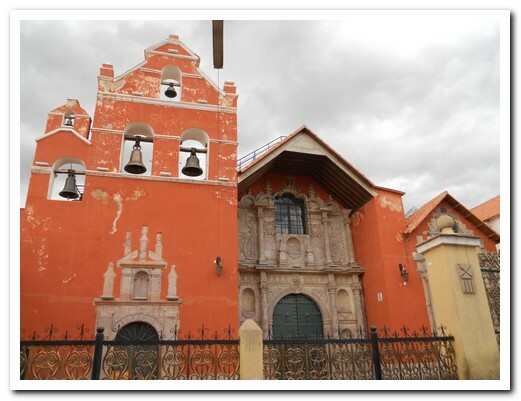 At 4060 metres Potosí, founded in 1545, is the world´s highest city and a Unesco World Heritage which once had over 80 churches and was the richest city in the world. 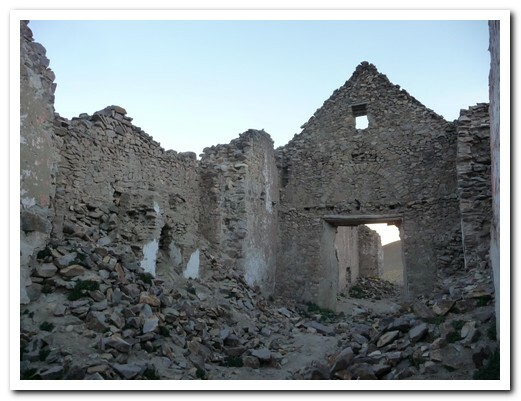 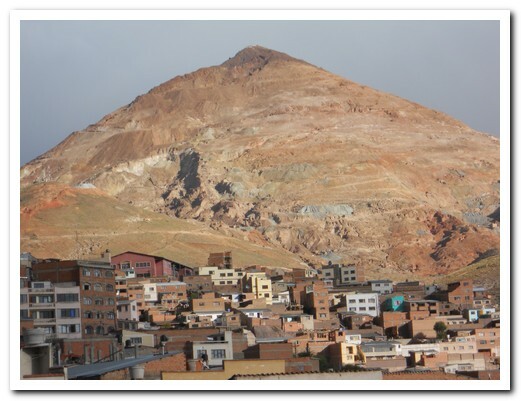 Silver from the mine supported Spain for over 200 years to the detriment of millions of Bolivian and African slaves. 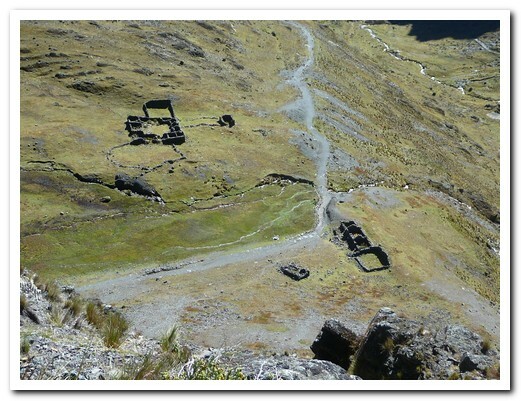 Conditions in the mine today are not much better. 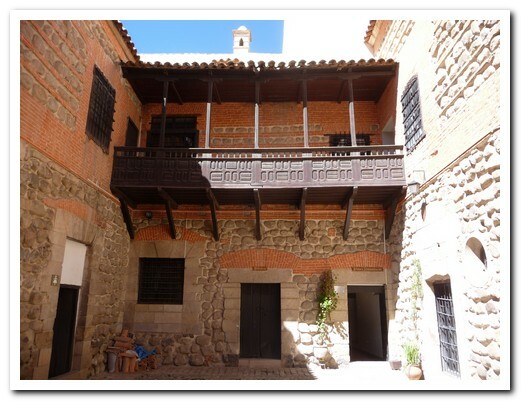 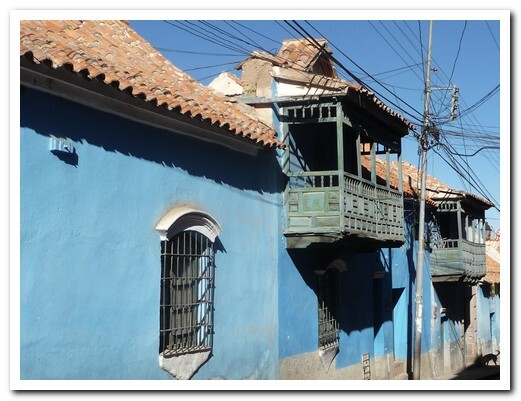 Many fine colonial buildings remain along the narrow cobbled streets of the old town. 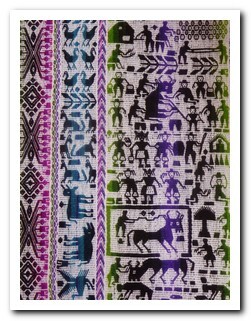 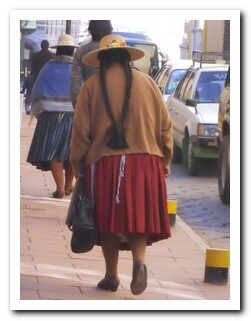 The traditional Bolivian women (Cholas) wear their hair in 2 long plaits with a hat on top, a full skirt (pollera) over multiple petticoats and wrap themselves in colourful shawls. 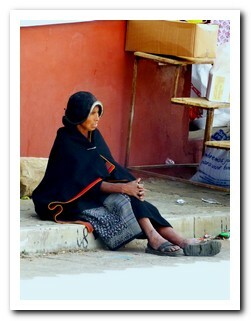 Sadly, the younger girls opt for jeans and t-shirts. 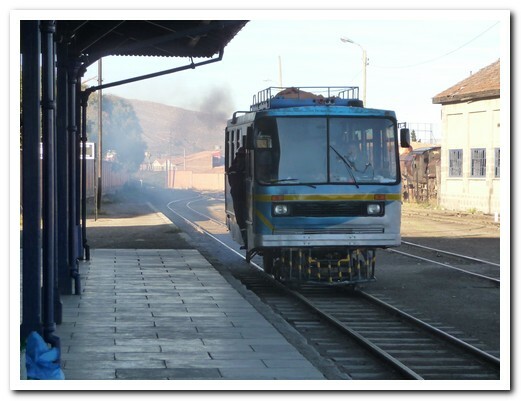 We were reluctant to leave Potosí but didn´t want to miss out on the little local trolly/train that wound its way around the hills to Sucre, stopping for people waiting by the tracks and at pueblos not reached by road. 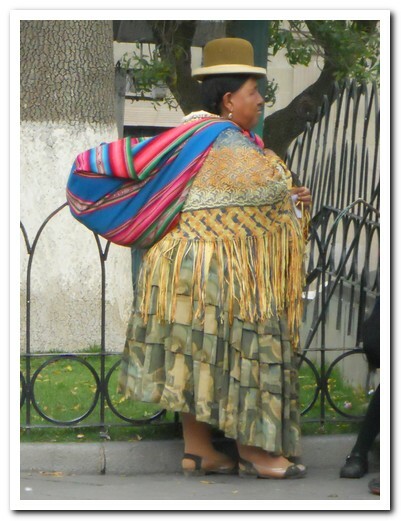 There were people with big bundles sitting in the aisles, someone had a dog, and someone got on with a bucket full of the local brew. 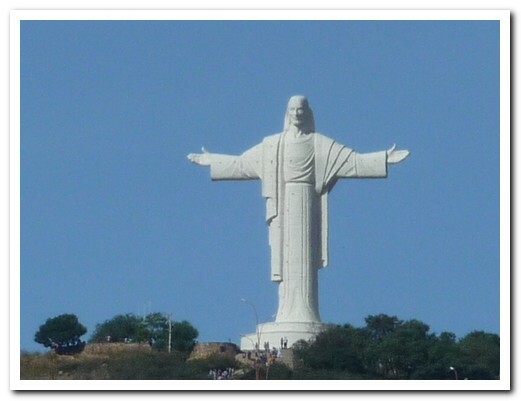 It took twice as long as the bus but well worth it. 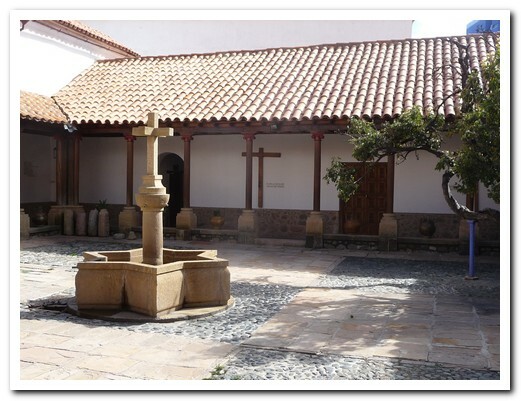 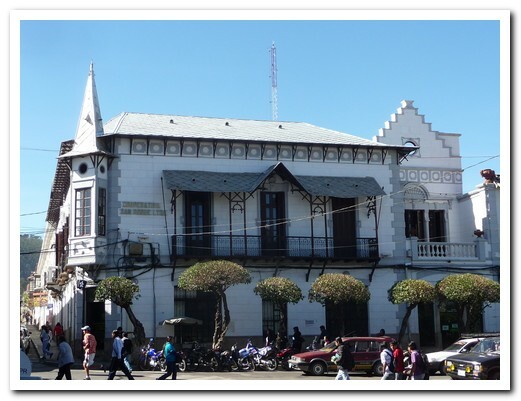 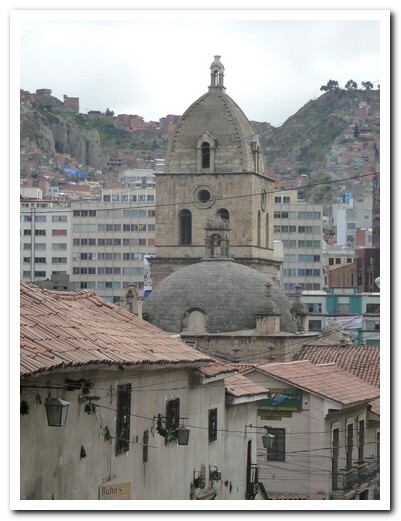 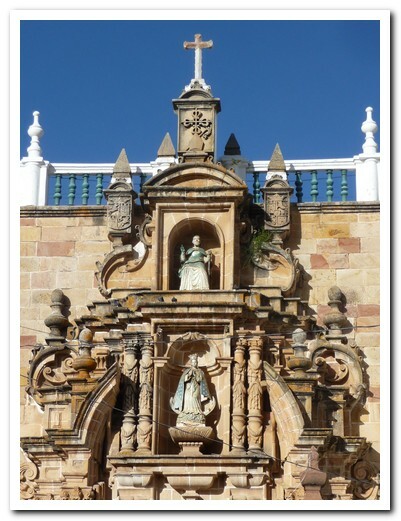 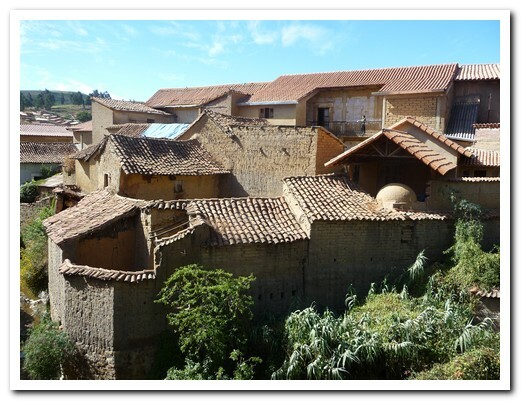 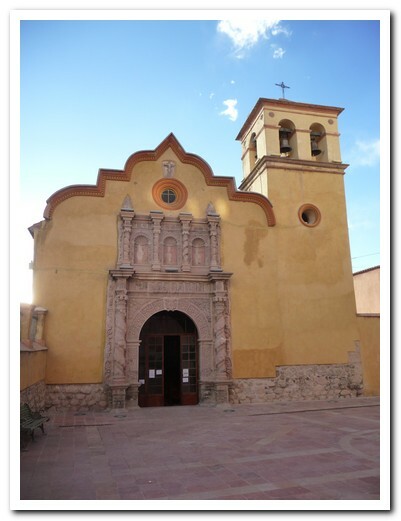 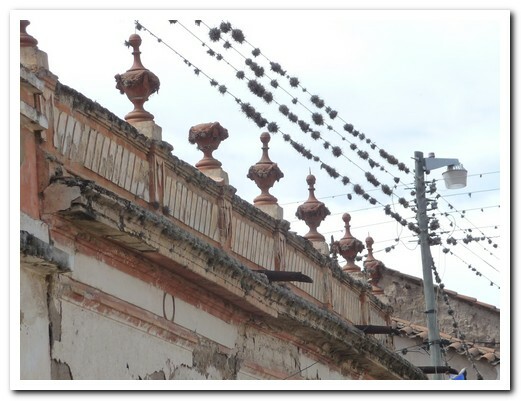 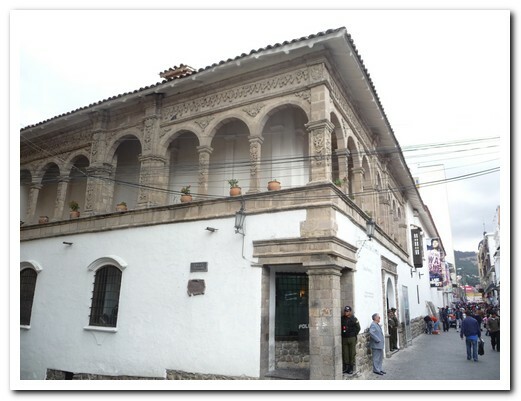 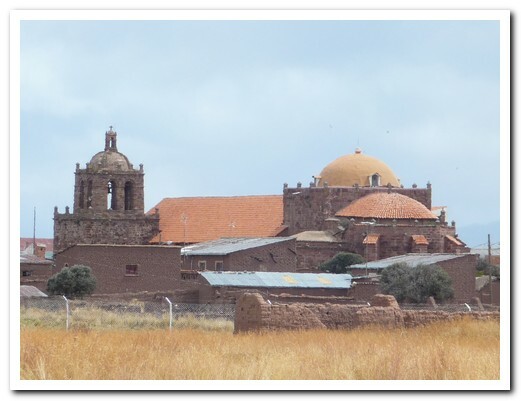 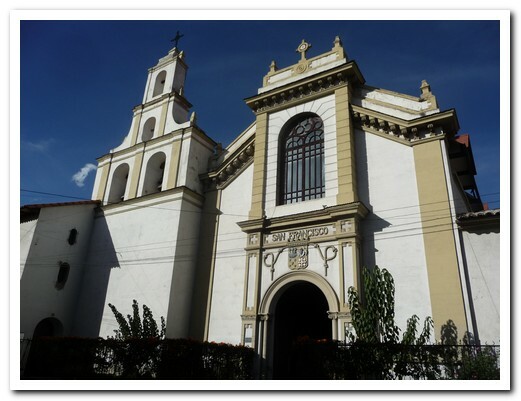 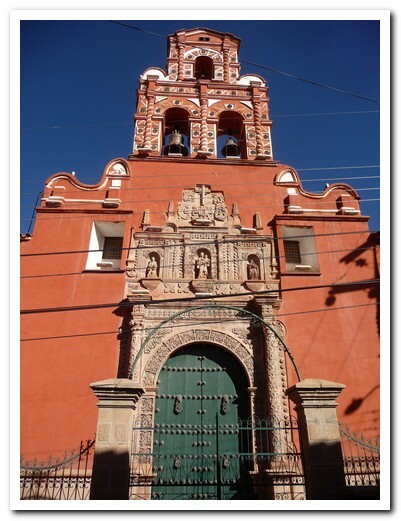 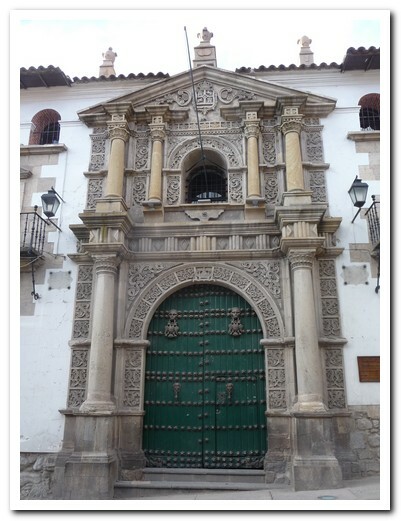 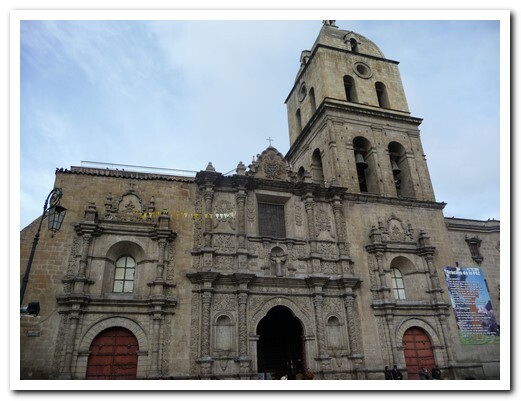 Sucre, founded in 1538, is a Cultural Heritage Site. 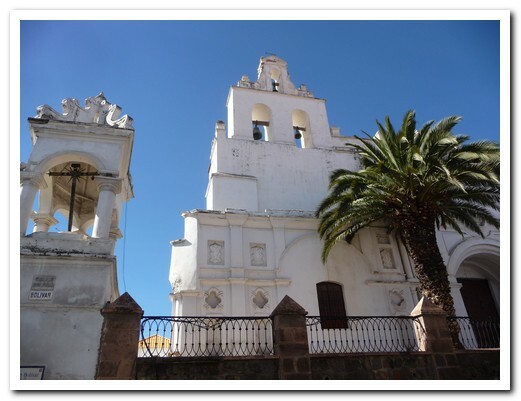 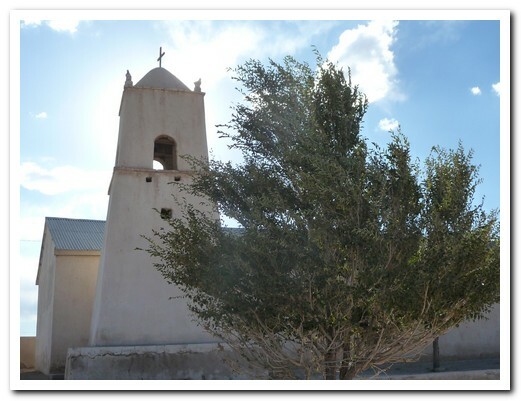 It is a city of dazzling white colonial buildings and churches. 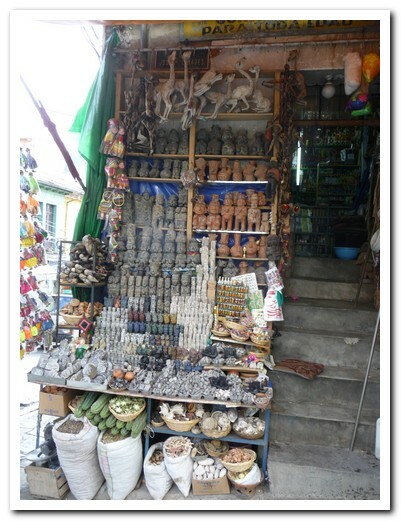 There is a bustling central market where anything and everything is sold. 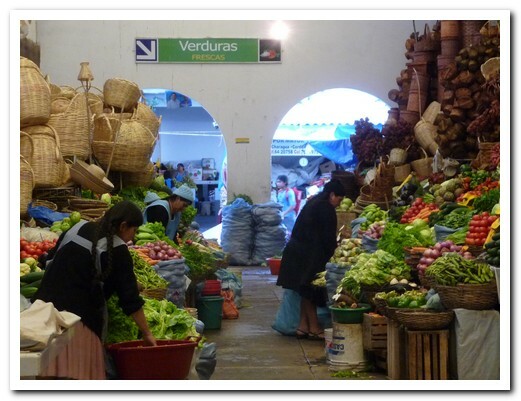 The local food is fresh, cheap and good. 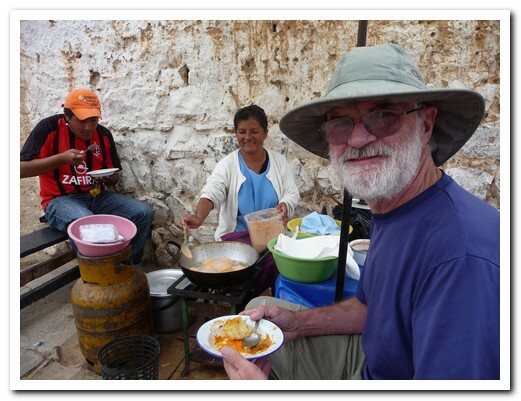 One of our favourites is papas rellenas (potato balls stuffed with cheese and egg). 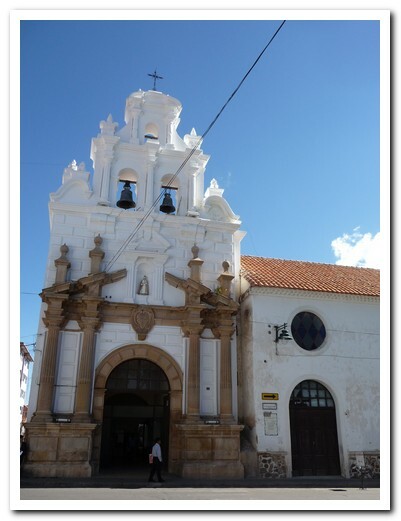 At Santa Teresa Convent we purchased sweets from the nuns by way of a miniature revolving door which isolates the nuns from the outside world. 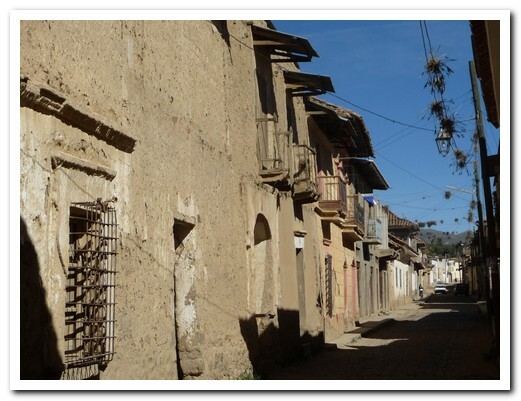 Around Sucre are many little pueblos where the indigenous women weave intricate pieces by traditional methods, dating back thousands of years. 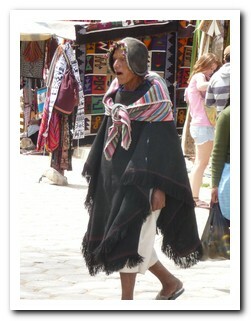 Tarabuco, 65 kilometres to the southeast where women weave multi coloured cloth, has a sprawling Sunday market. 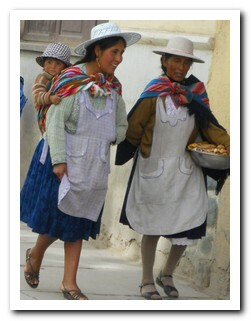 People from the nearby pueblos arrive in traditional dress. 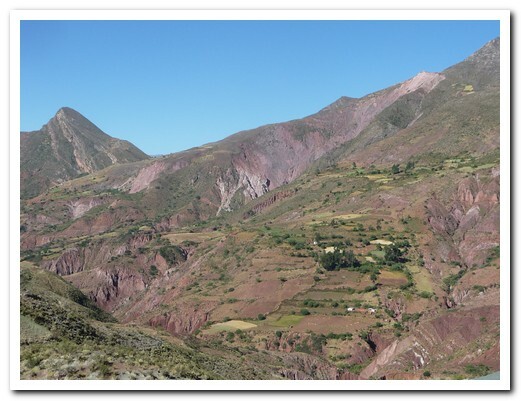 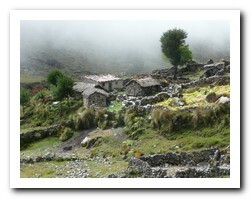 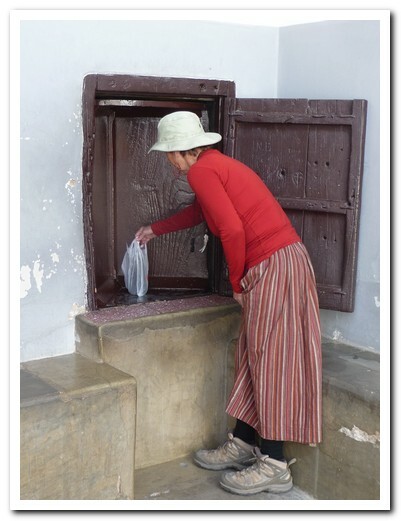 A 4 day trek in the Cordiellera de los Frailes took us through small Quechua speaking communities. 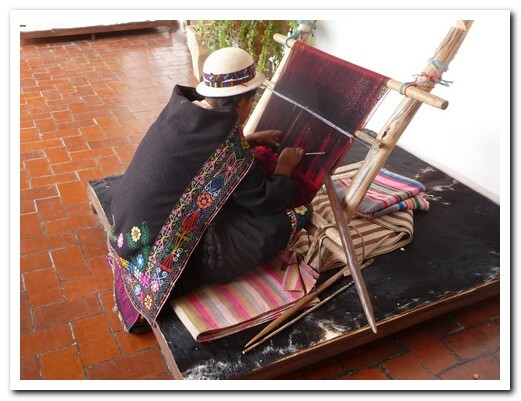 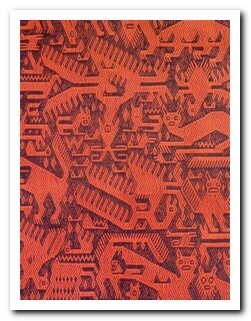 Here the women weave black and red cloth panels with no set pattern. 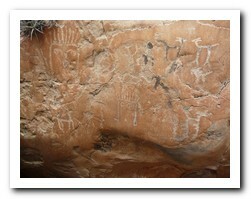 The technique has been passed down the generations, each one taking 3 months to complete. 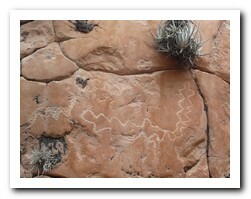 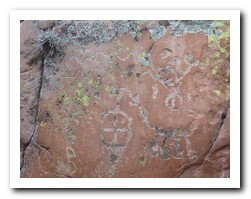 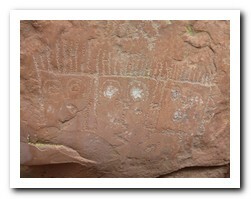 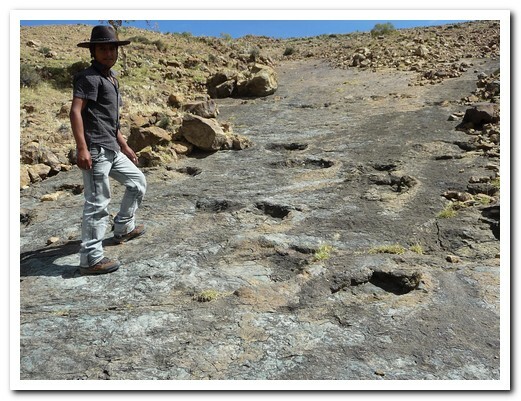 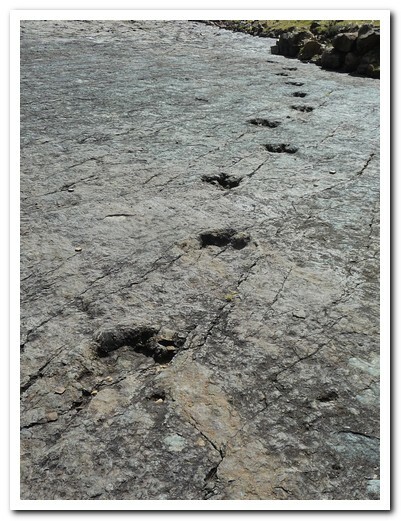 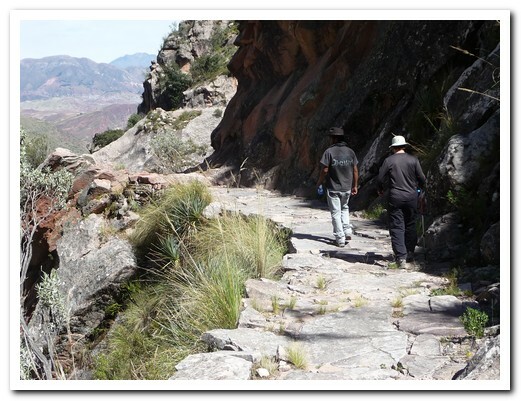 We walked along old Inca footpaths, saw dinosaur footprints and pre Inca pictographs. 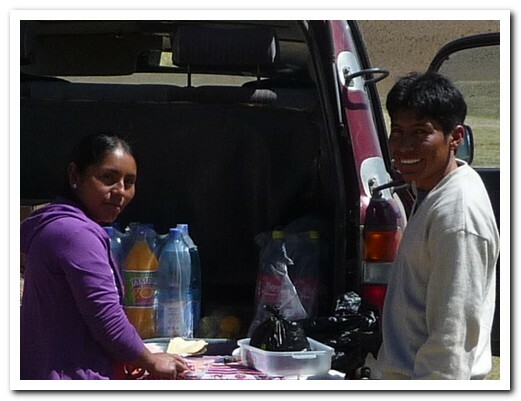 In one of the pueblos we shared a field workers lunch. 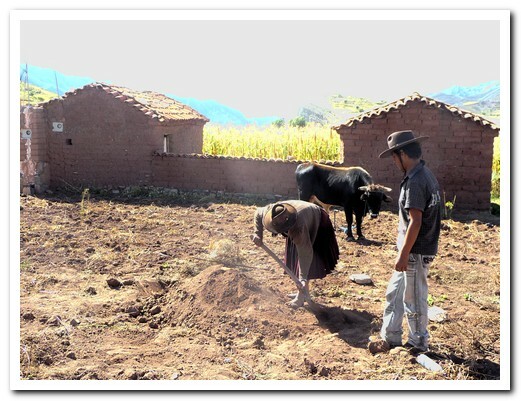 Potatoes, corn cobs and beans are placed in coals and covered with earth in the middle of the field. 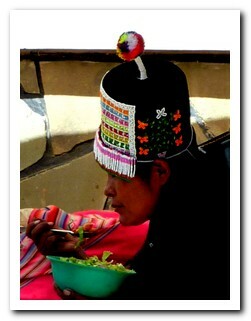 The food slowly cooks while the people work. 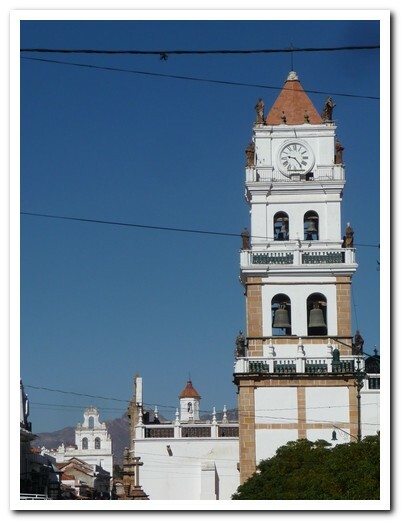 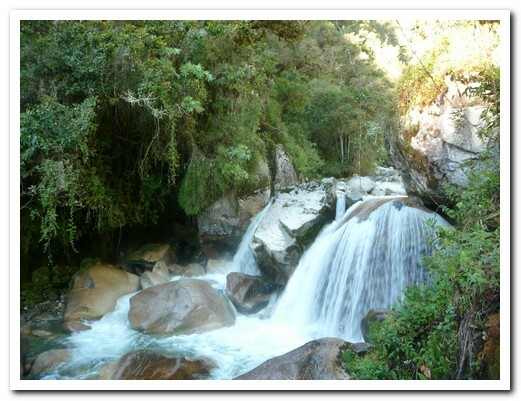 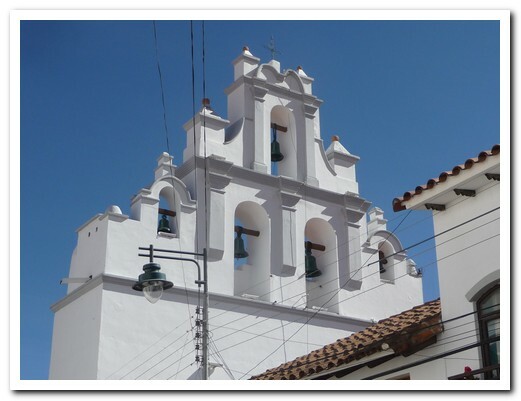 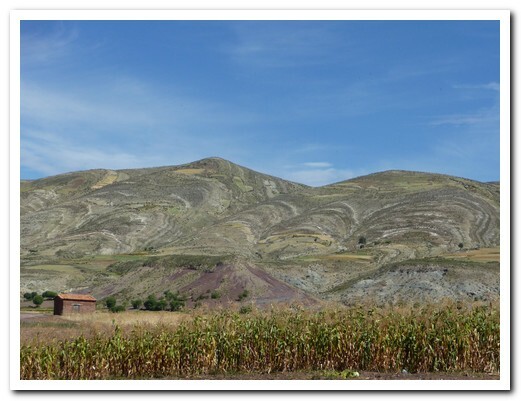 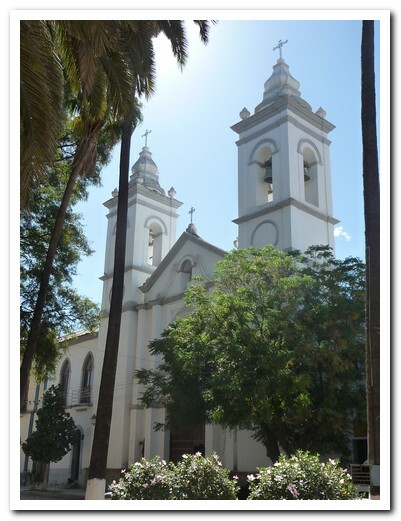 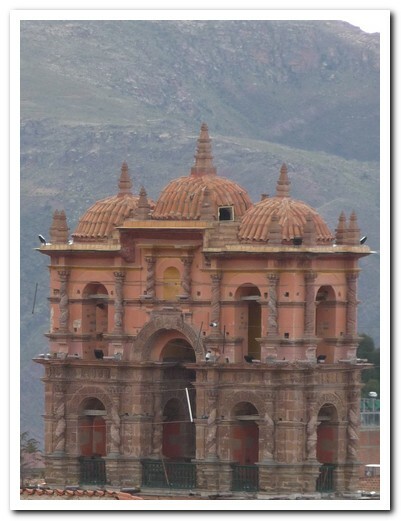 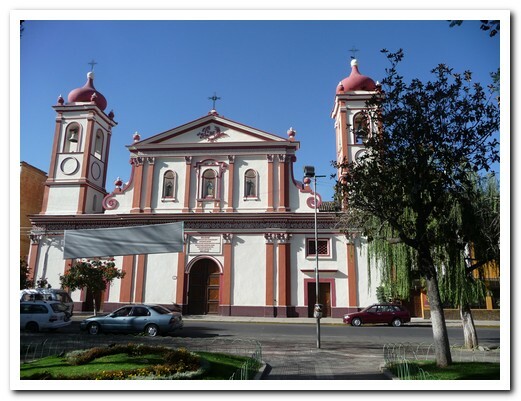 Cochabamba lies in a wide fertile valley surrounded by high mountains. 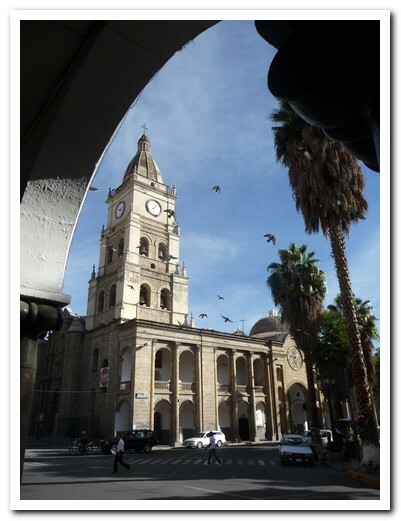 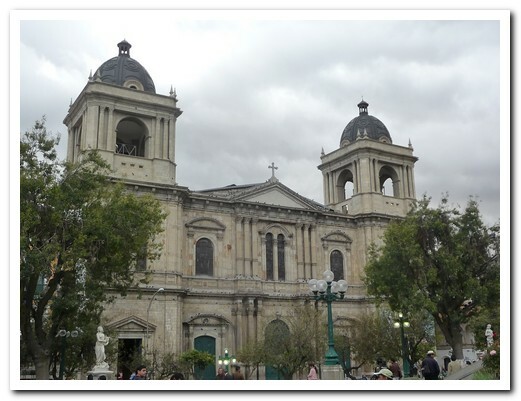 It has the usual handfull of colonial churches in the center and a busy market. 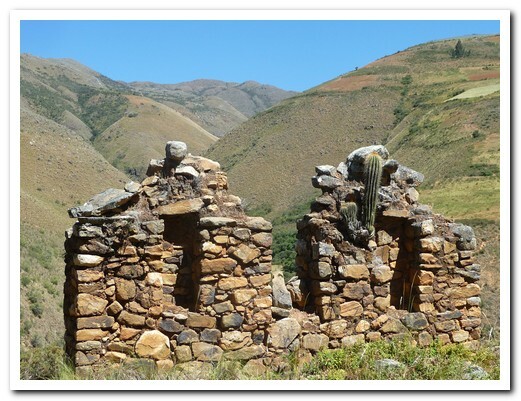 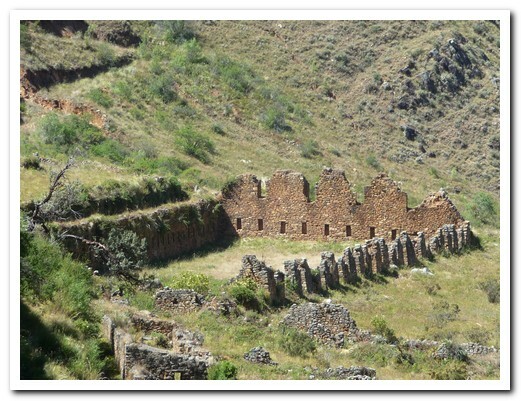 We hired a taxi for the day to take us into a remote valley to see the rarely visited ruins of the fortified Inca city Incallajta, 150 kilometers from Cochabamba. 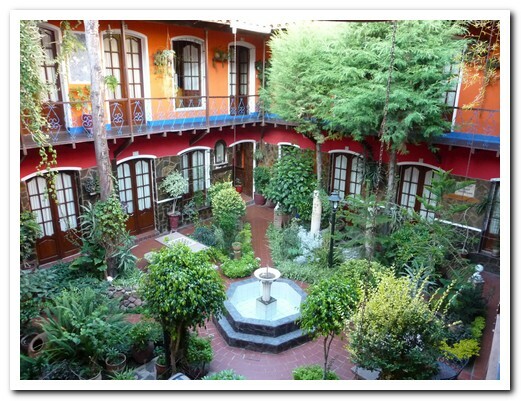 It is an enormous complex. 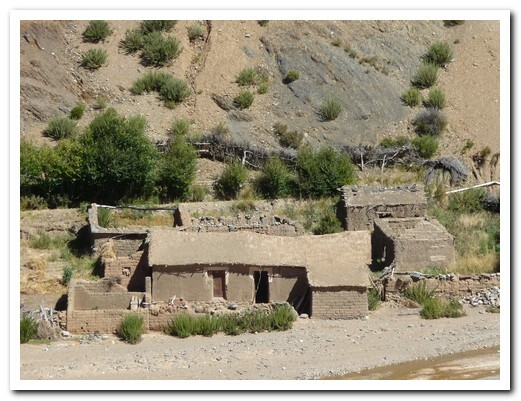 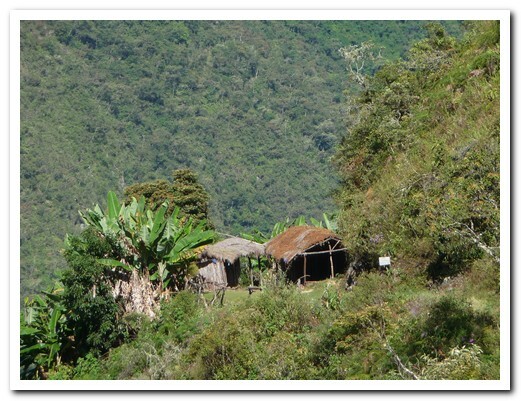 On the way we visited the little mountain pueblos of Tarata and Totora. 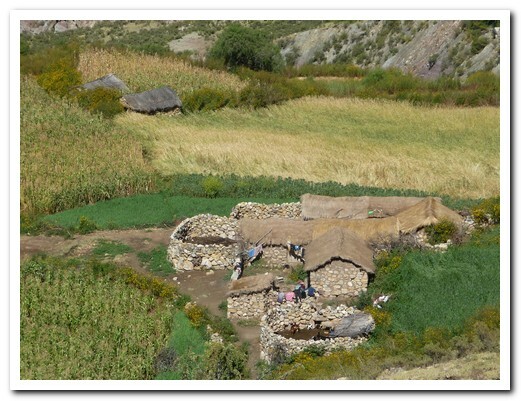 From Cochabamba our bus struggled up towards La Paz, reaching the Altiplano at over 4400 metres, passing lone farms where people were cutting wheat by hand and small pueblos where busy markets were in progress. 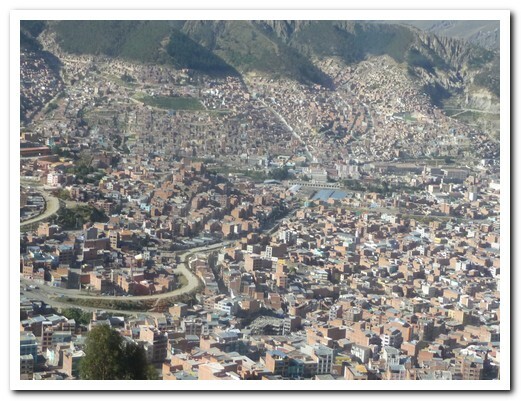 The first sighting of La Paz city (3660 metres) spilling down both sides of a steep canyon and surrounded by snow capped peaks is always breathtaking (the altitude is breathtaking as well). 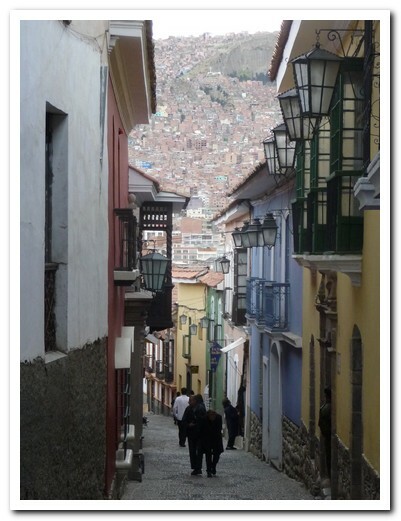 Once in the city there is hustle and bustle everywhere. 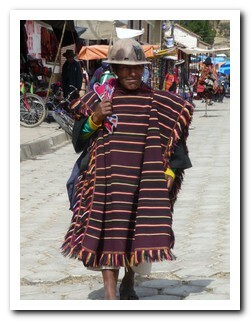 Everything is for sale in the streets even dried llama fetuses. 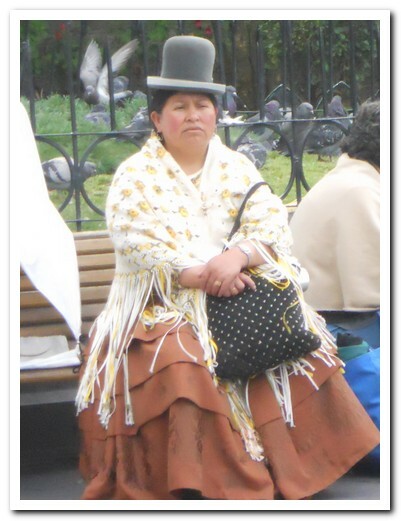 The Aymara women (from around Lake Titicaca) wear bowler hats, brightly coloured full skirts and intricate shawls (mantas). 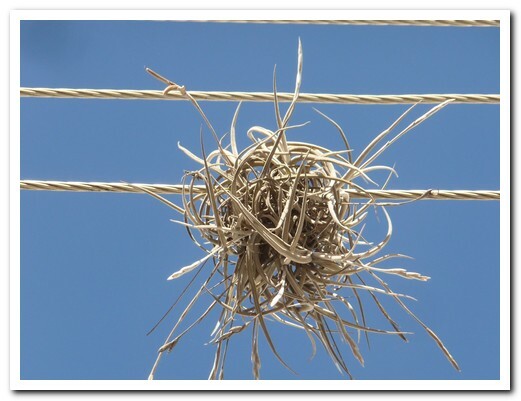 Years ago, a local English businessman received a shipment of mens bowler hats by mistake. 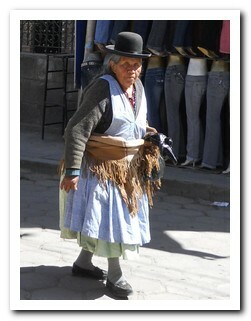 He managed to convince the Bolivian women to wear them and the new fashion took off. 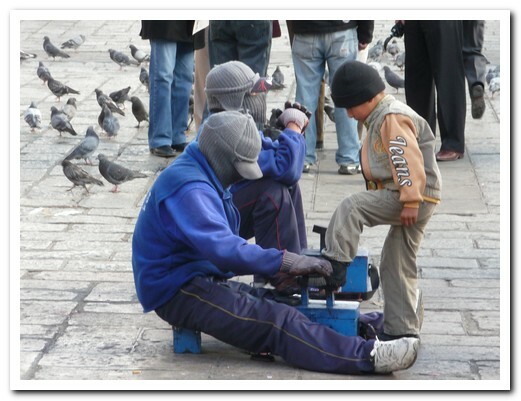 The shoe shine men hide their identity behind ski masks and baseball caps to avoid social stigma. 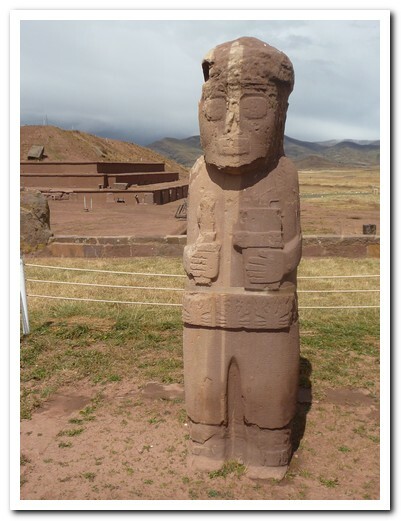 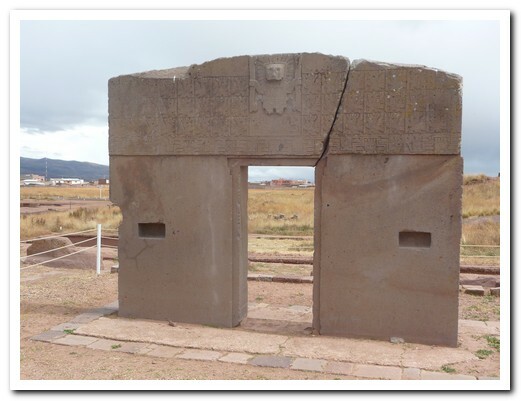 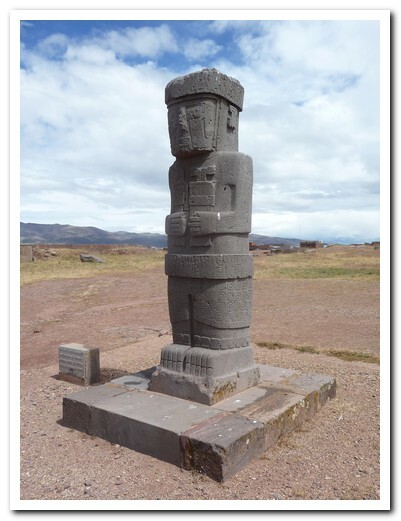 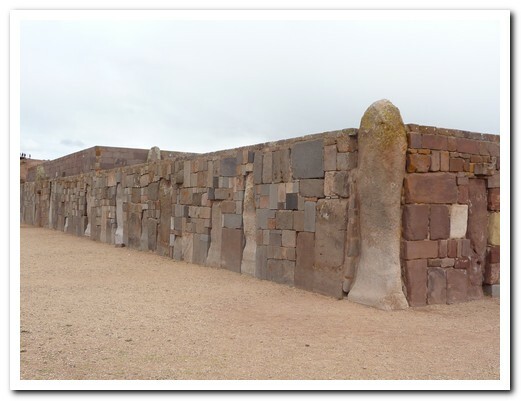 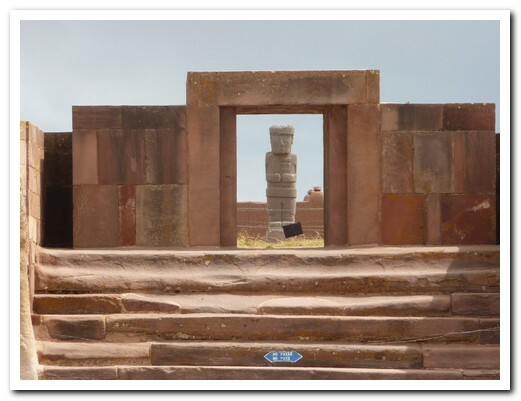 Not far from La Paz are the ruins of Tiwanaku, a pre Inca ceremonial centre, and the most important archaeological site in Bolivia. 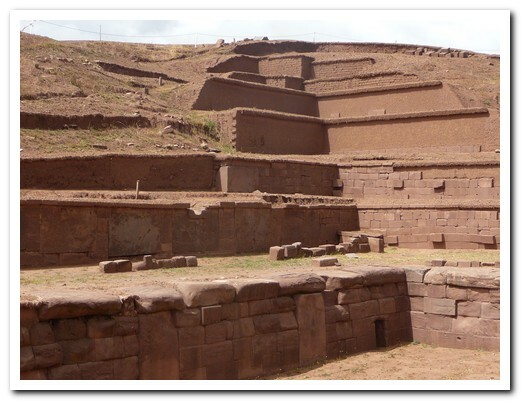 It is slowly being excavated and partly restored. 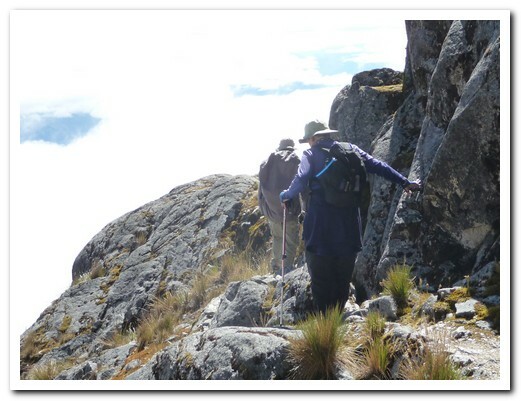 From La Cumbre at almost 5000 metres in the Cordillera Real north of La Paz, we began the Choro trek organized by Deep Rainforest. 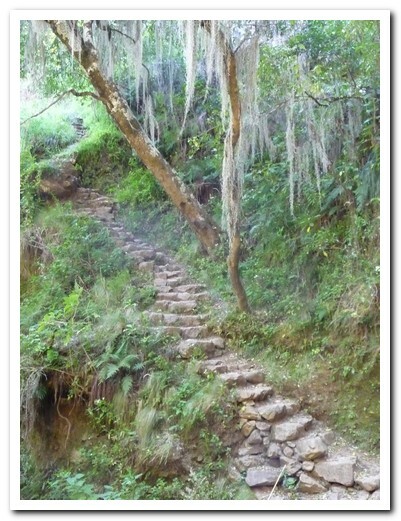 We set off down a 900 year old stone footpath covered in ice which soon melted as we descended steeply. 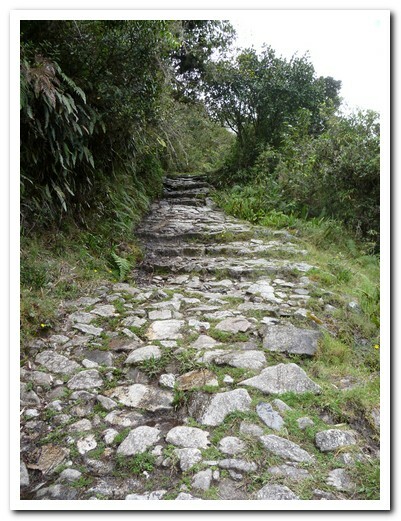 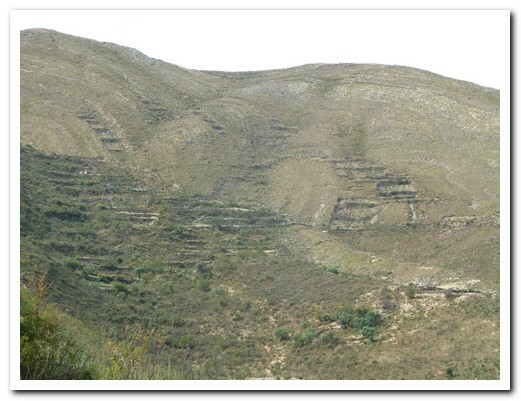 The path was the main route between the Altiplano and the Amazon region and is still used and maintained by the small communities living along the way who travel up and down on foot. 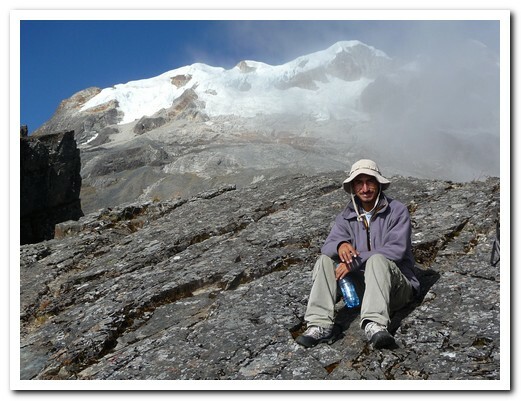 The first day, led by our capable guide Guido, we descended 2000 metres. 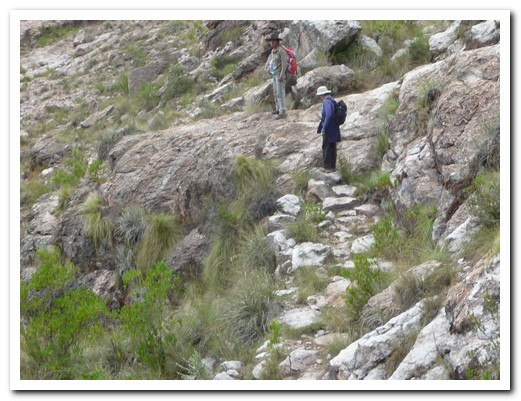 Our muscles felt it the next day descending another 800 metres before a steep climb after which the path levelled off to follow around the mountainside hundreds of metres above the valley. 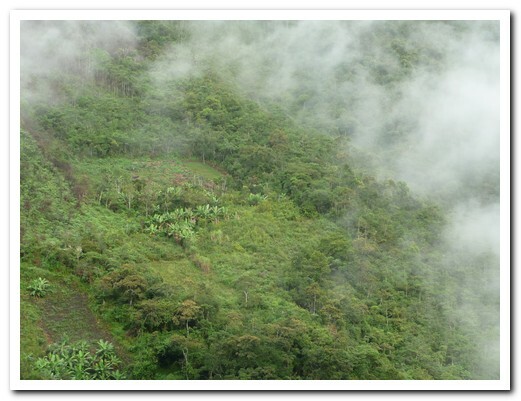 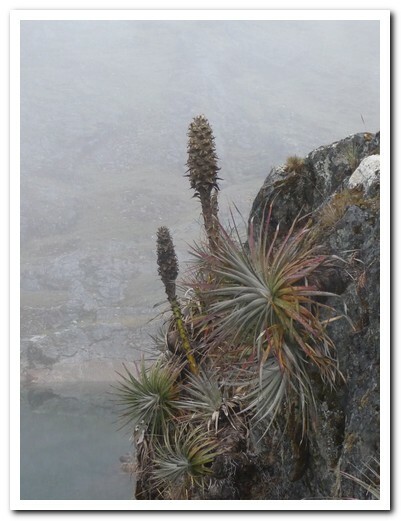 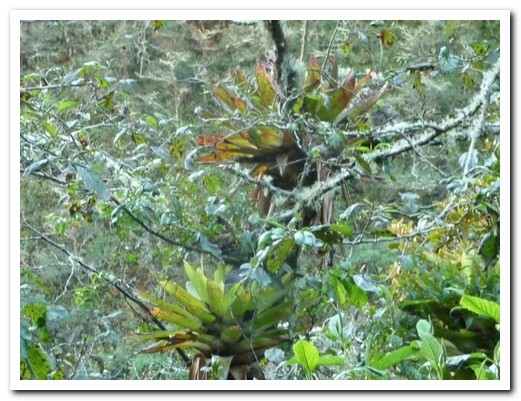 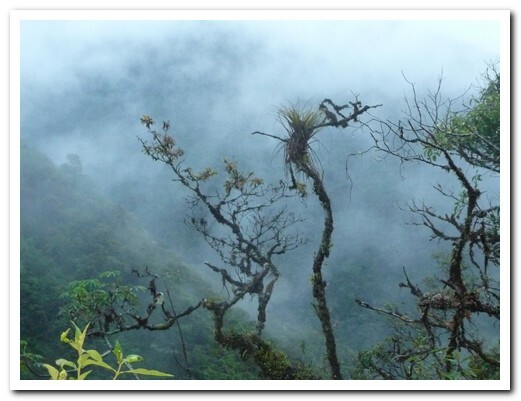 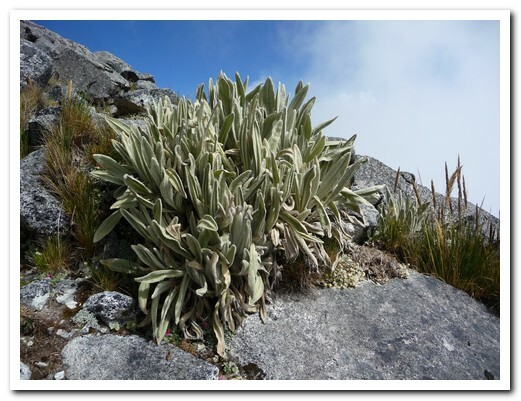 The treeless slopes and grazing llamas gave way to forests of trees covered in old man’s beard, supporting orchids and bromeliads getting moisture from mist off the waterfalls and clouds filling the valleys. 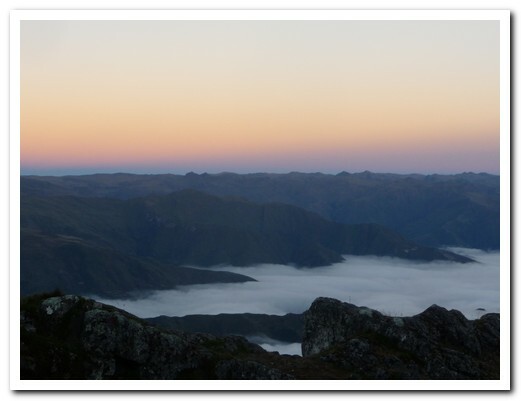 We camped 2 nights perched on the side of mountains with spectacular views across the valleys. 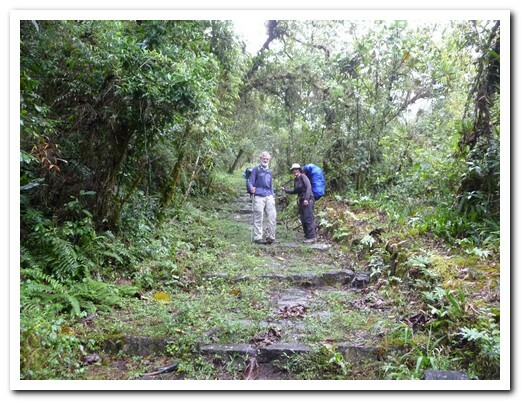 We set off at dawn on our last day, the rainforest dark and dripping moisture, the path overgrown in places. 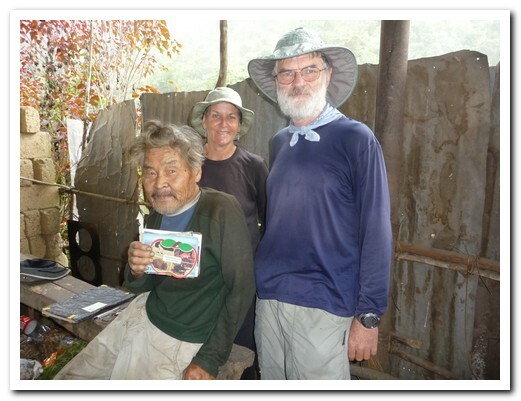 We came across a little bent up old Japanese man, Tamiji Hanamura, 89 years old who had been living by himself in this isolated spot for more than 50 years. 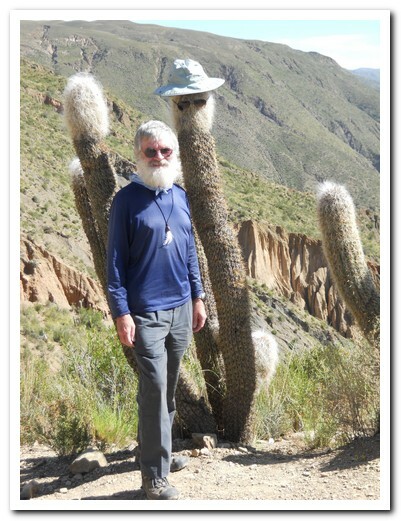 He loves to talk to visitors and show them his many post cards from different parts of the world and shares his lovely garden with campers. 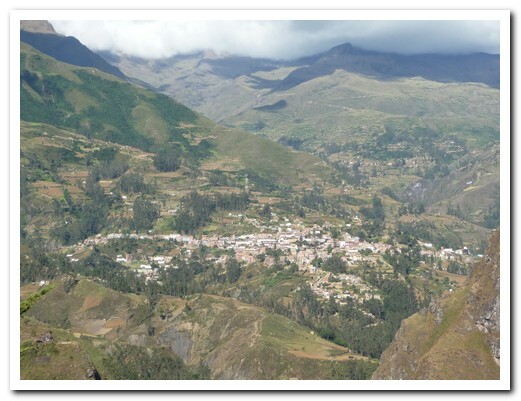 Our trek ended in Chairo at 1300 metres from where we took a scary taxi ride up to the hill town of Coroico where we spent the night before returning to La Paz. 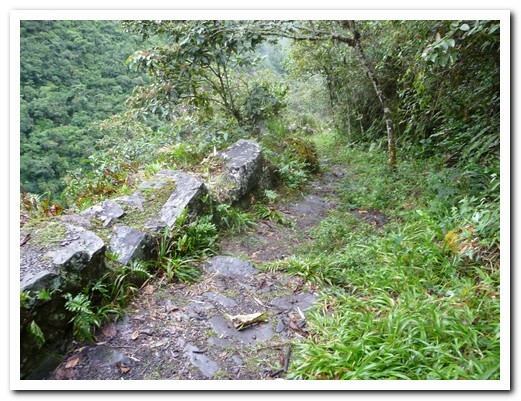 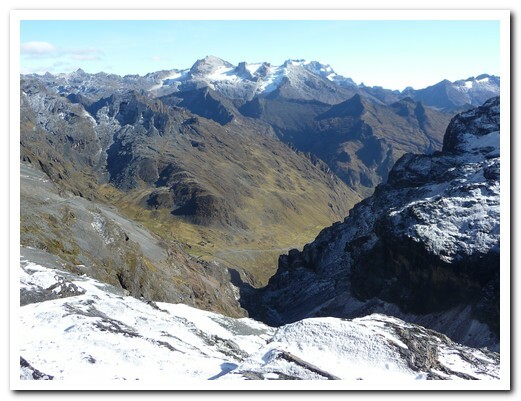 Between La Paz and Coroico used to be the “world’s most dangerous road”. 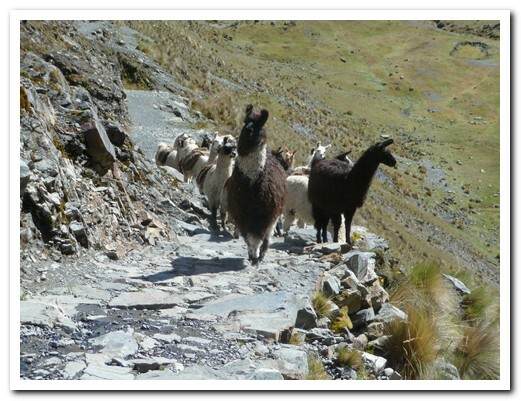 Now that there is a new road for traffic, tour operators offer “the world’s most dangerous bike ride” on the old one. 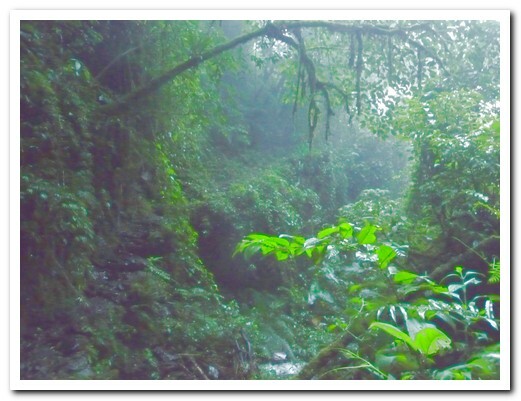 Now we are really in the jungle! 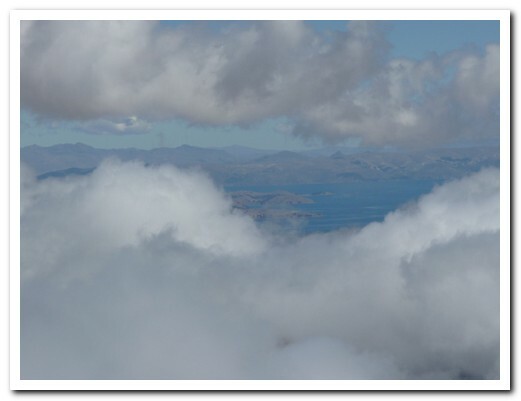 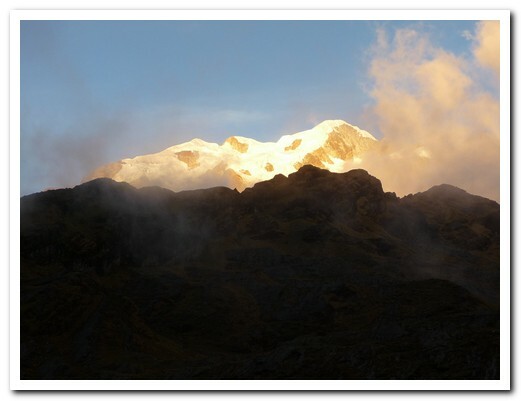 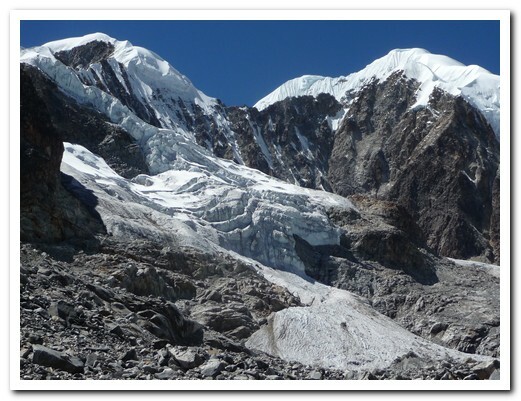 There are many trekking opportunities from La Paz and many adventure companies. 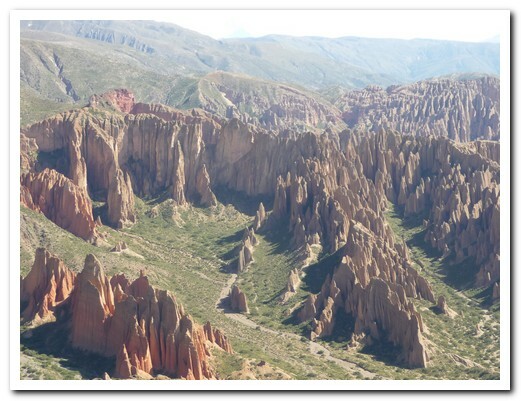 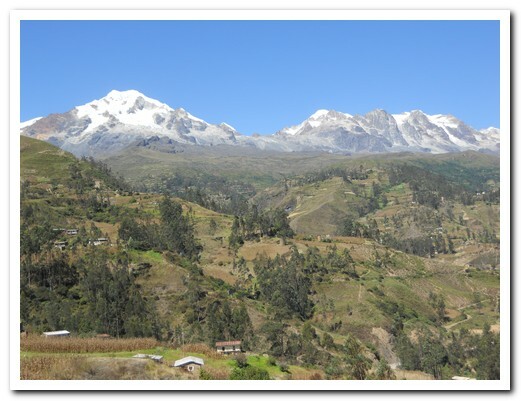 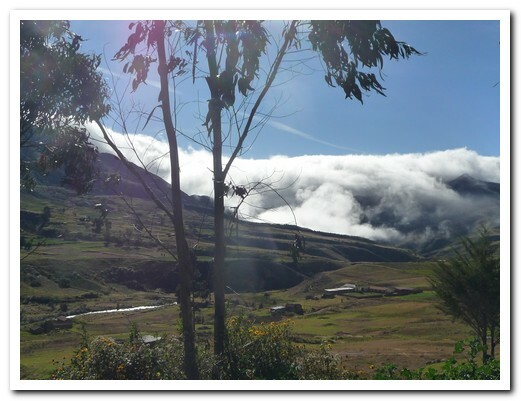 We chose a trek for 2 people with Zig Zag Eco Tours starting in the peaceful mountainside town of Sorata (2700 metres), 3 hours north of La Paz. 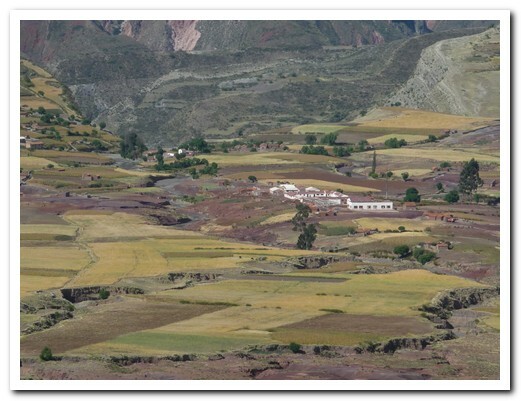 The bus makes its way down a spectacular valley dotted with communities and their colourful fields of maize. 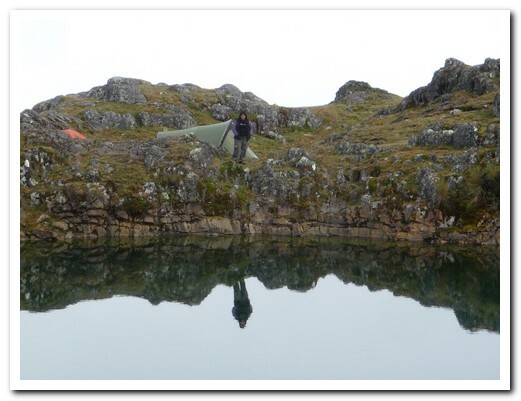 Together with our experienced guide Ivan and great cook Syrle, we began the punishing climb up to the sacred Lake Chillata at 4200 metres where we camped for 2 nights beside the lake. 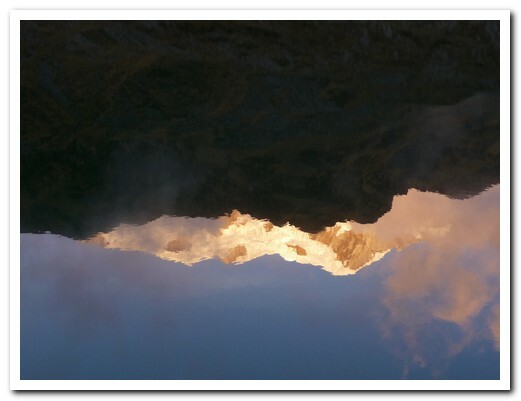 The snow capped mountains were reflected in the still water, the fog rolled in and out. 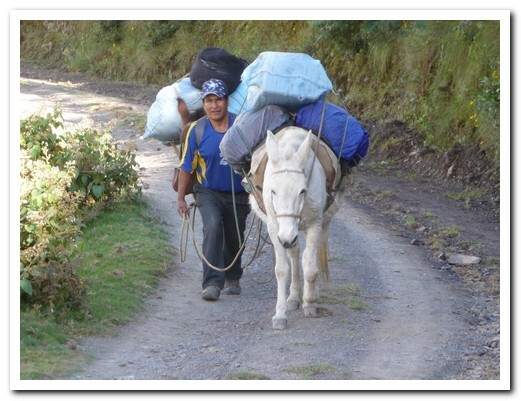 Our packs and the rest of the gear went up ahead on 2 mules led by Don Vicente. 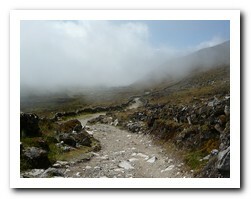 The next morning we set off in the mist to climb up to Laguna Glacial at 5038 metres. 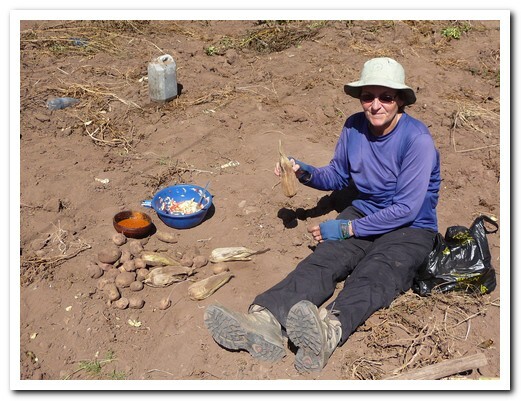 Syrle had made a delicious picnic lunch which we enjoyed beside a stream below the glacier at 4800 metres with views down to Lake Titicaca. 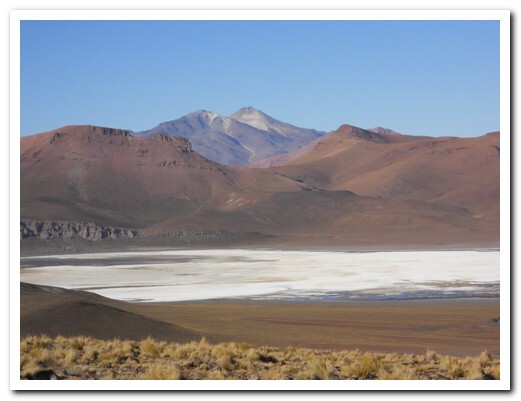 Lack of time and fitness as well as the high altitude prevented us from going all the way to the lake but we were more than happy to turn around where we did. 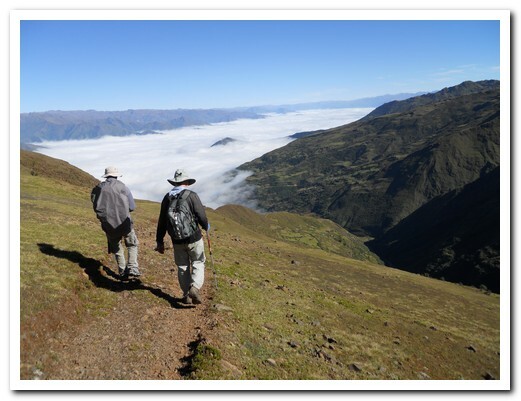 Our final day was the steep descent back down into the cloud filled valley. 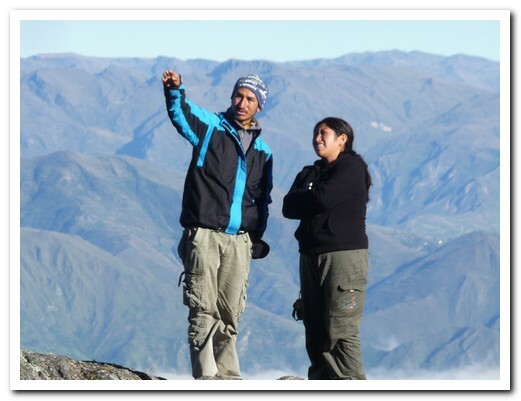 The weather was perfect, the Illampu mountains clearly visible behind us as we trekked towards Sorata.